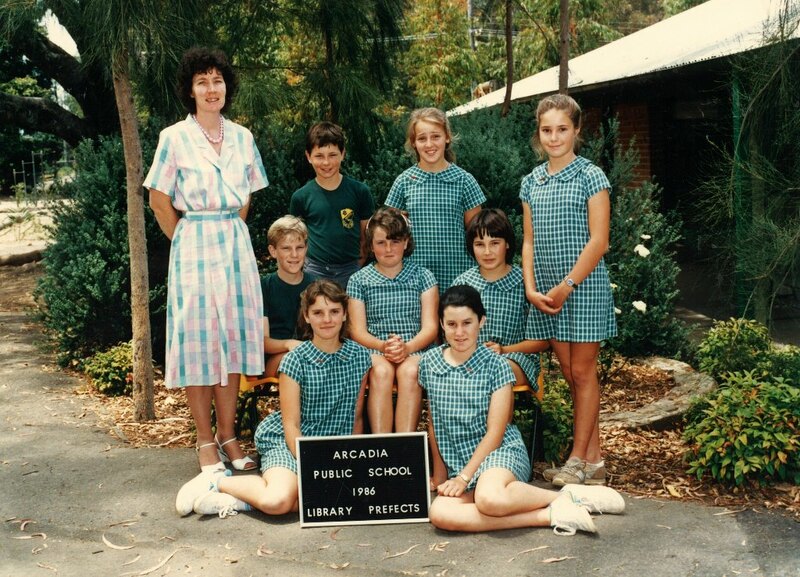 1981 – In 1981 the new library was built. 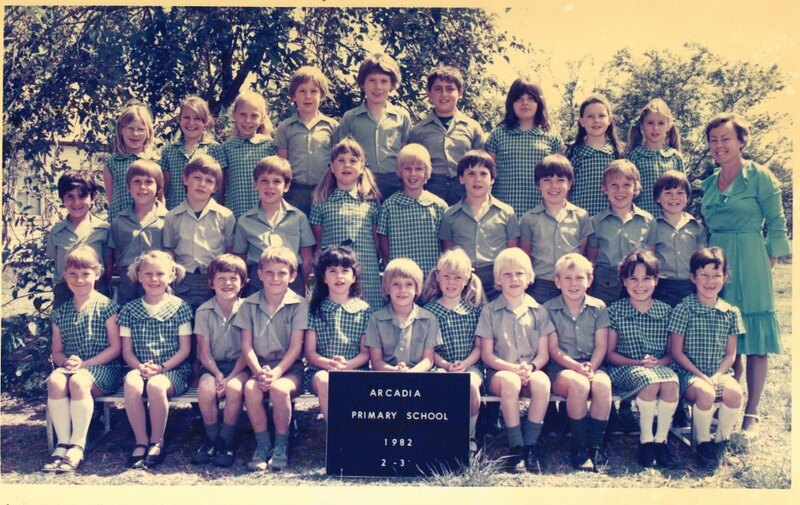 This was part of what was a much grander plan for Arcadia’s New School Buildings. 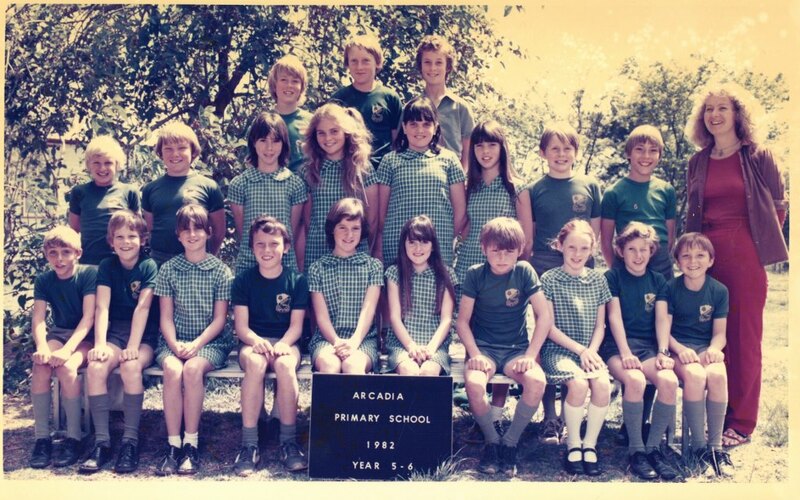 Although history shows that the new school plans went to tender the project was shelved by the Department. 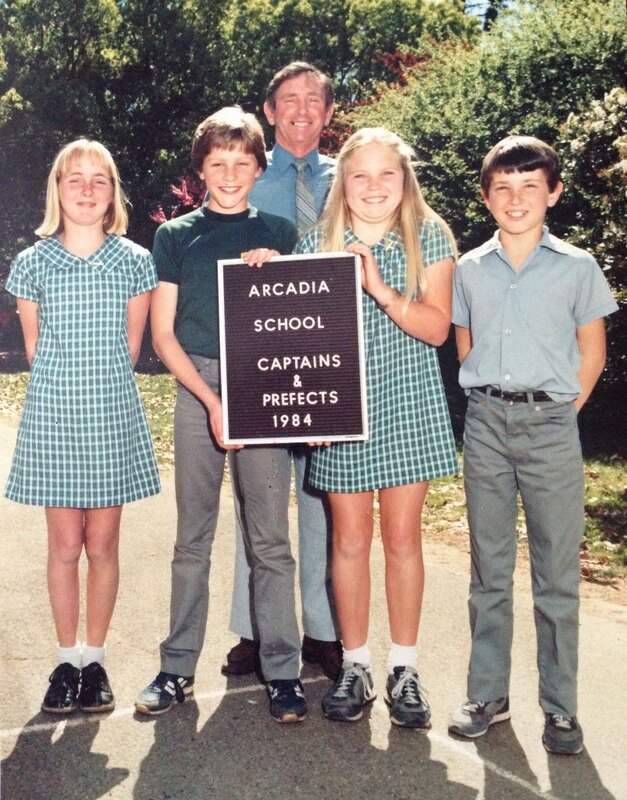 This was one of a number of definite plans shelved as Arcadia was not a growing area plus lack of Government finance. 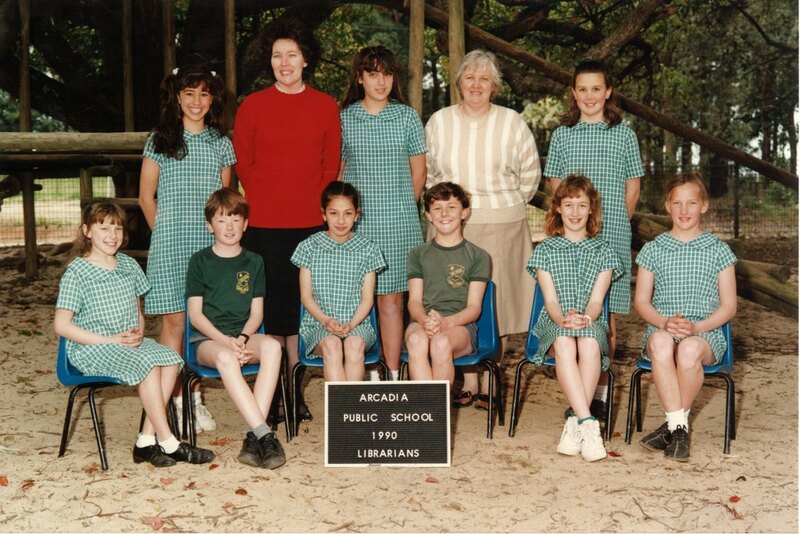 However, the construction of the library building did proceed along with many other schools in the ‘year of the Library’. 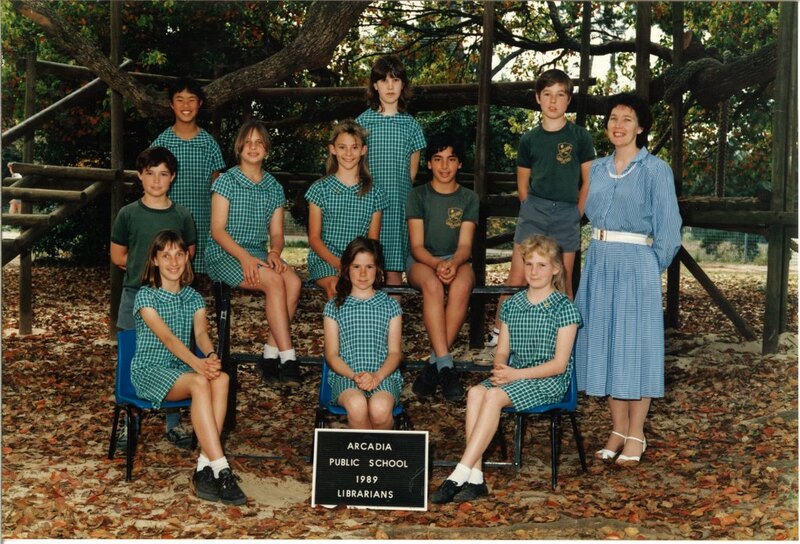 The P&C has always been very generous with donations to buy books for our library which sees us with one of the best stocked school libraries. 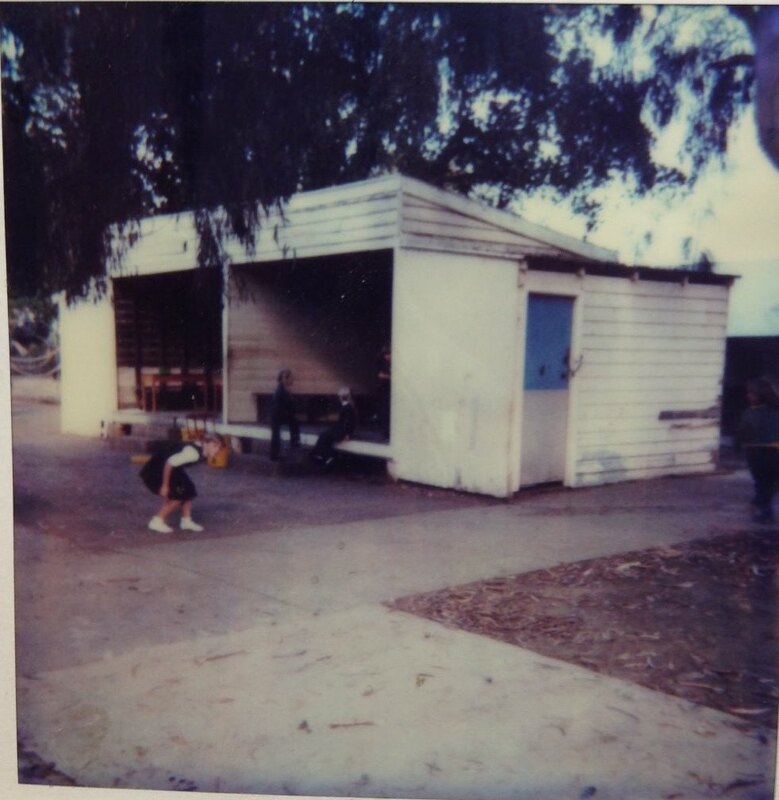 1981 – Mrs Tennant, a kindergarten teacher in 1981, saved this well from demolition when the new library was built by standing in front of the bulldozers thus saving a piece of our history. 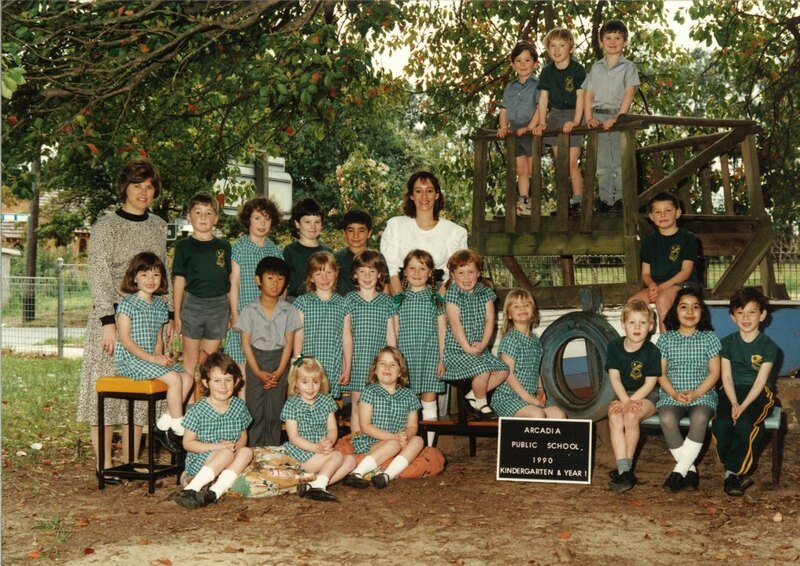 A bird bath and garden stand as a memorial to Mrs Tenant and her actions and Roses where planted. 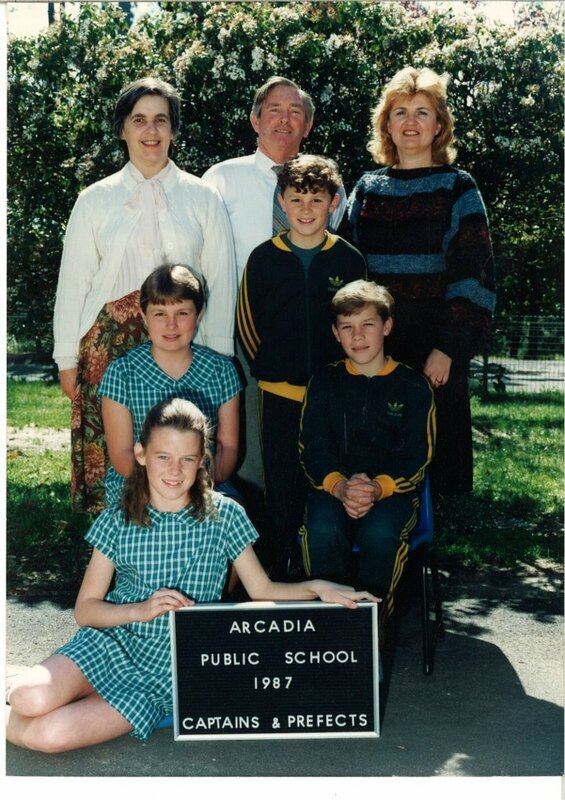 In 1994 Camellia japonica ‘Brushfields Yellow’ were planted on top of the tank as part of the centenary celebrations. 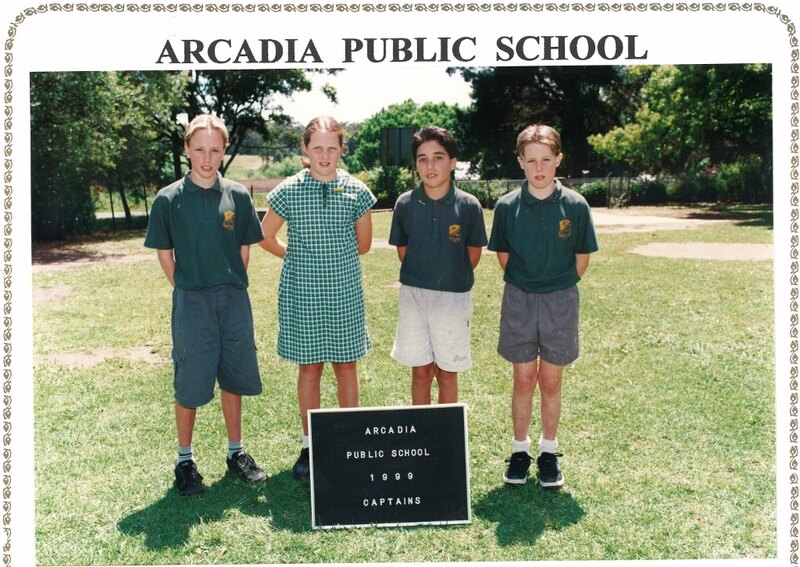 This variety was chosen for the yellow flower colour and green foliage as they were close to the school colours, the green and gold. 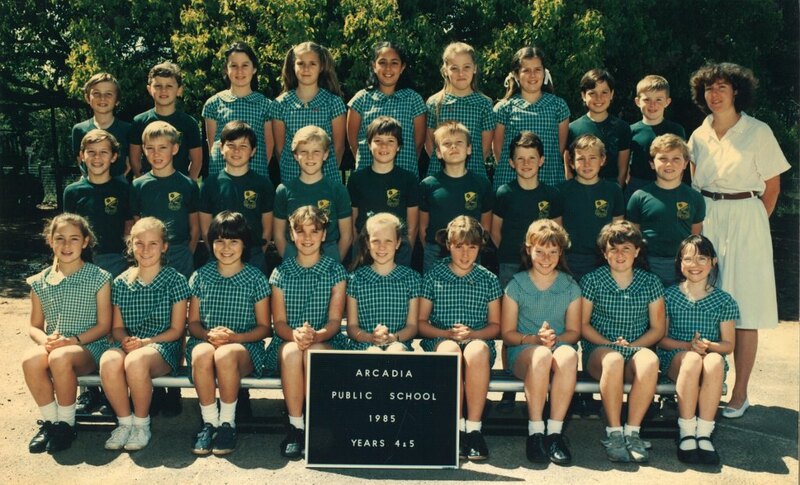 This garden will be renovated as part of the 120 year celebrations in 2014. 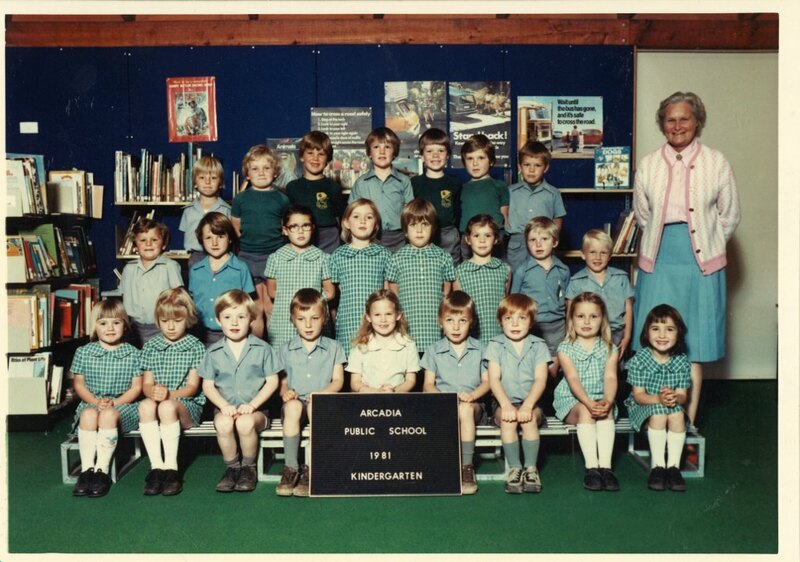 1981 – On 14th April 1981 the P&C held their first meeting in the new library. 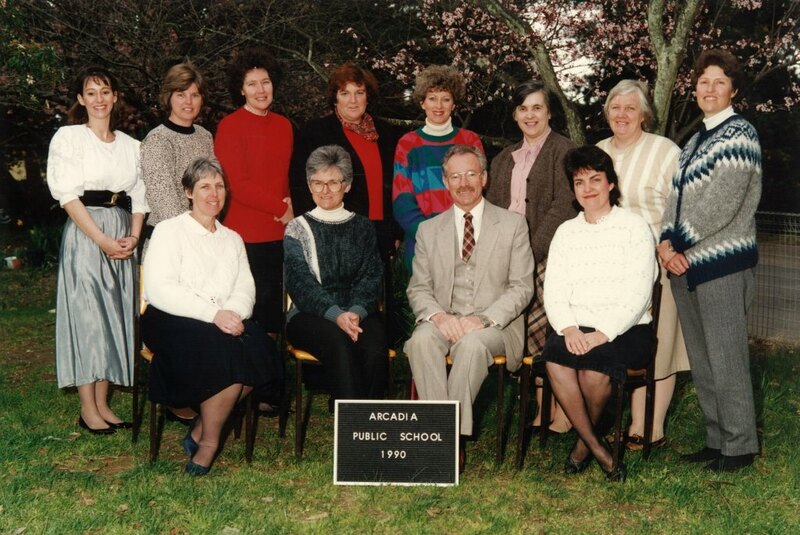 Grant of $100 per month contributed to the purchase of some 3,000 books. 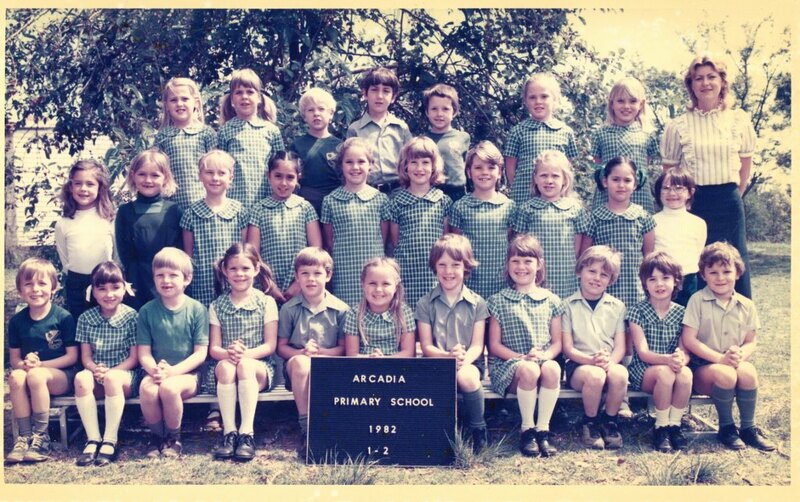 1981 – The school residence, which had been rented out, was in a poor state of repair due to termite damage. 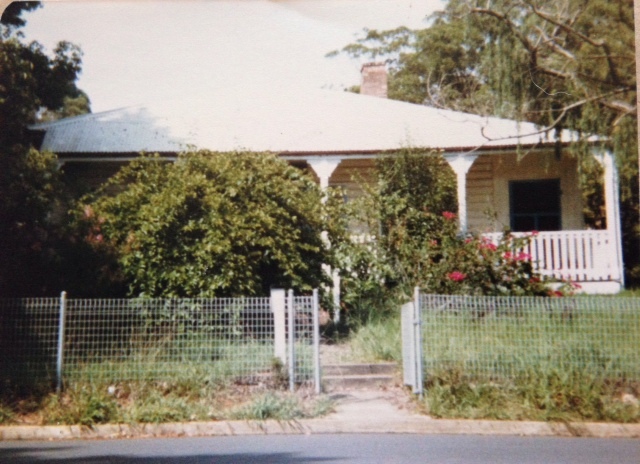 It was demolished despite strong opposition from the local community. 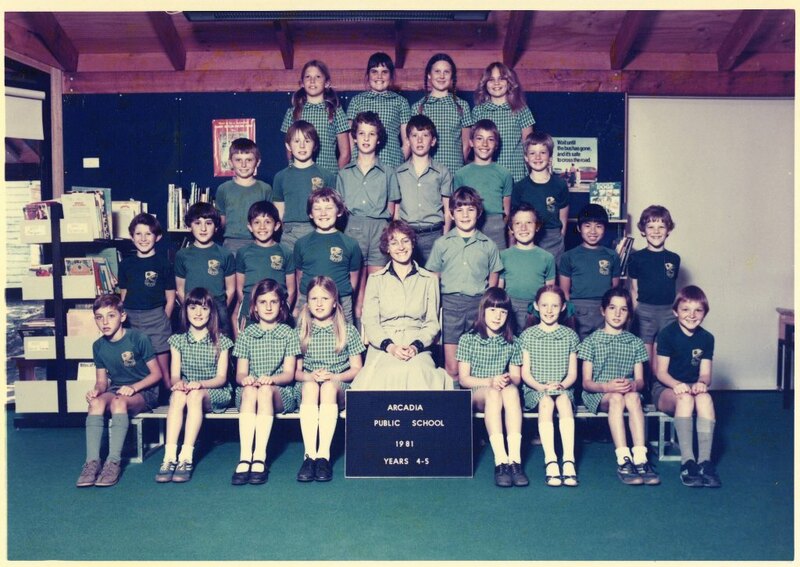 1982 – The school was provided a Rover ride-on-mower. 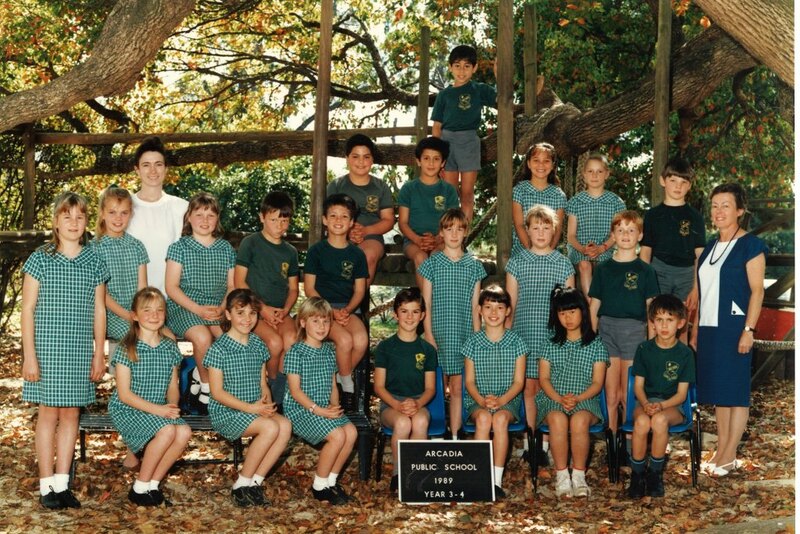 Parents were on a roster for the year to mow the school grounds. 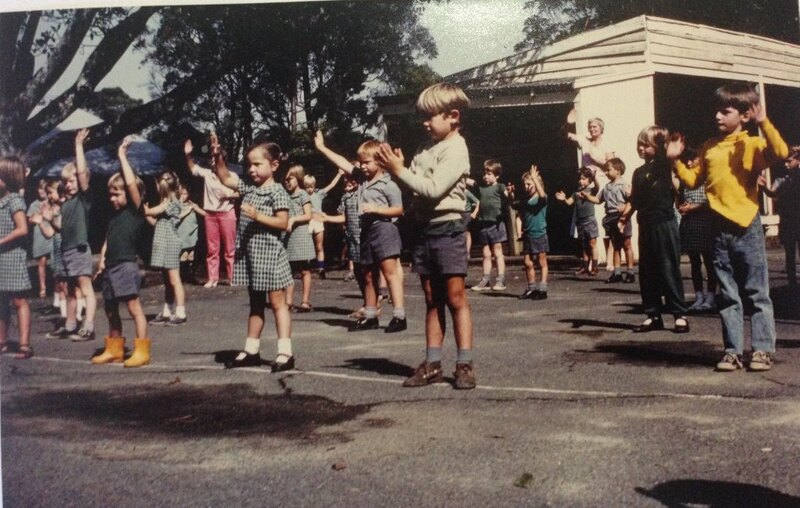 Petrol was provided. 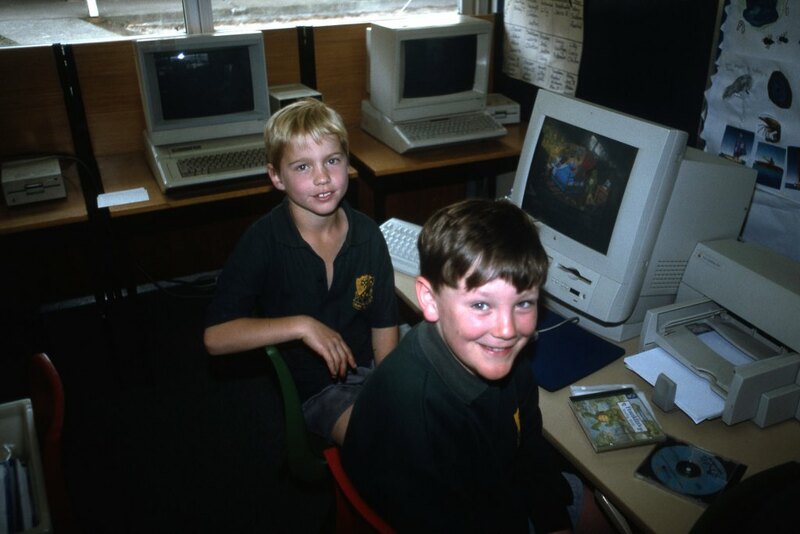 1982 – The students were introduced to computers in 1981 with the arrival of the first Apple computer and a Microbee. 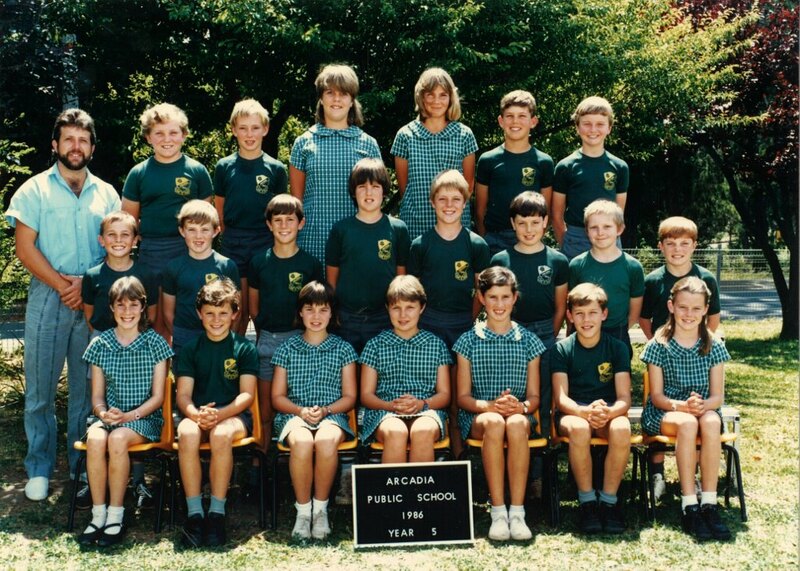 1983 – The P&C in conjunction with the teachers agreed on the ‘No Hat No Play’ policy. 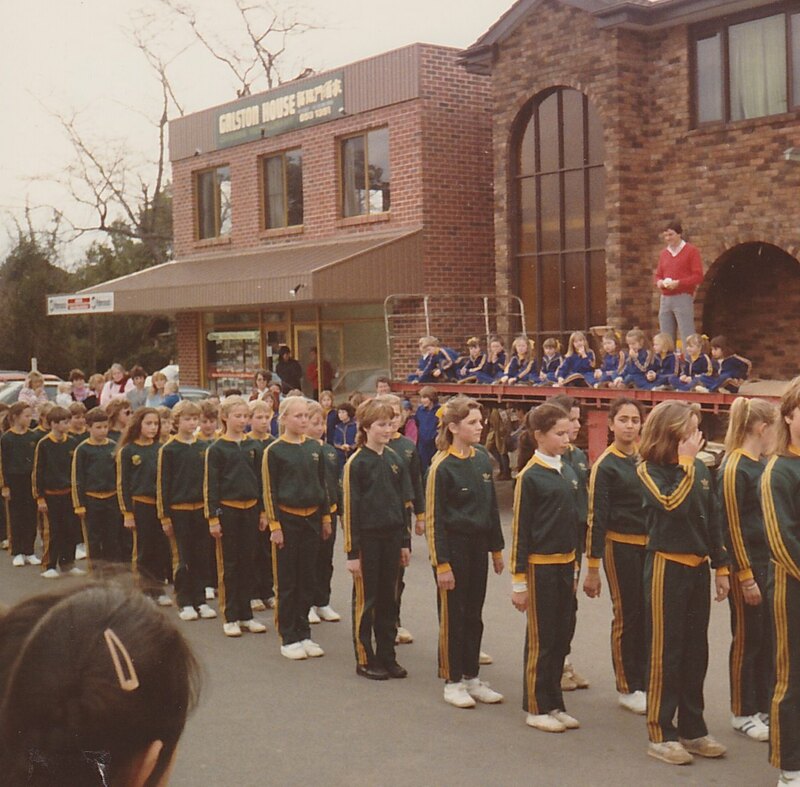 Two Glockenspiels were purchased for the school by the Mothers Auxiliary. 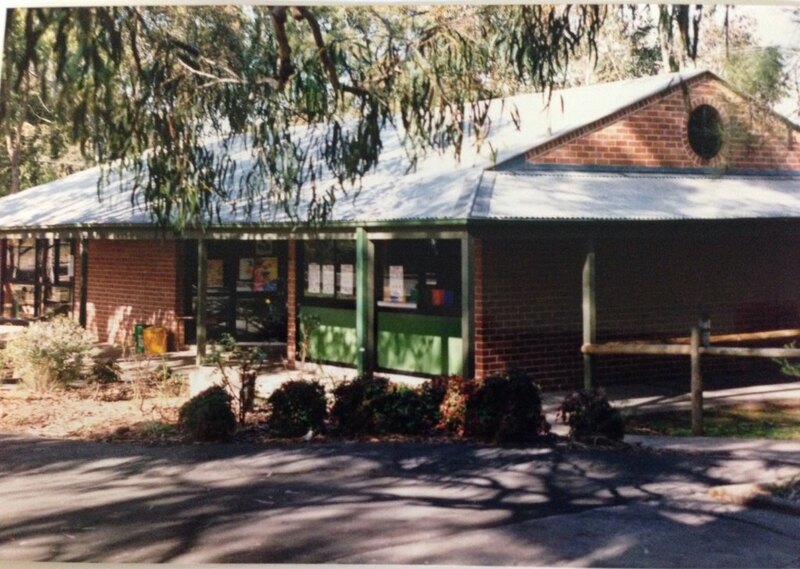 1984 – The P&C built the chook shed. 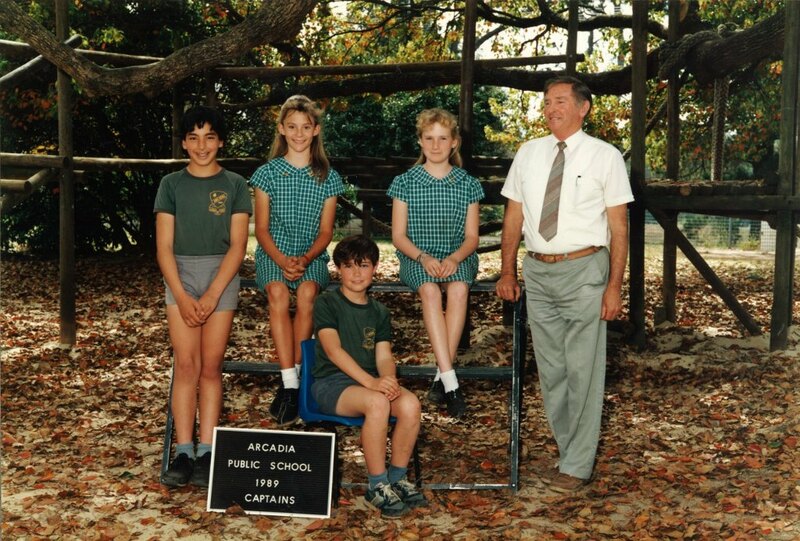 The old timber weather sheds which had stood for 85 years were demolished allowing an assembly area plus netball court to be built. 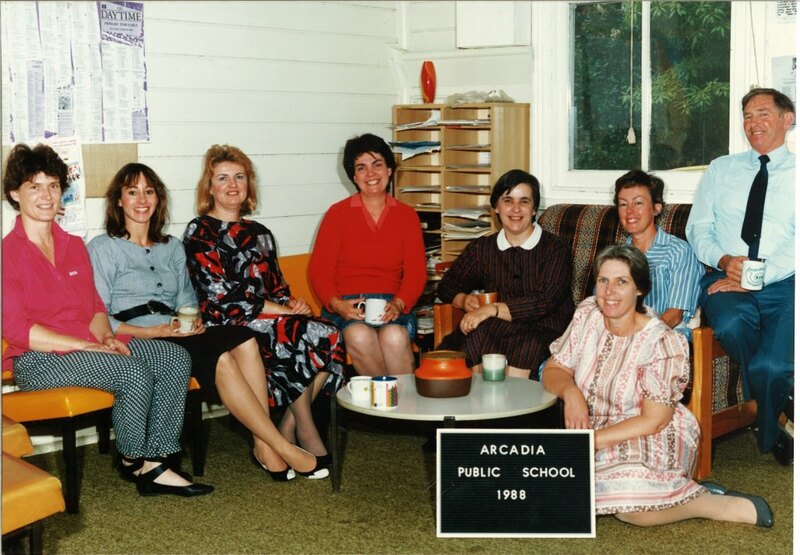 1984 – A helper’s luncheon was put on by the teachers for any parent who helped at the school throughout the year. 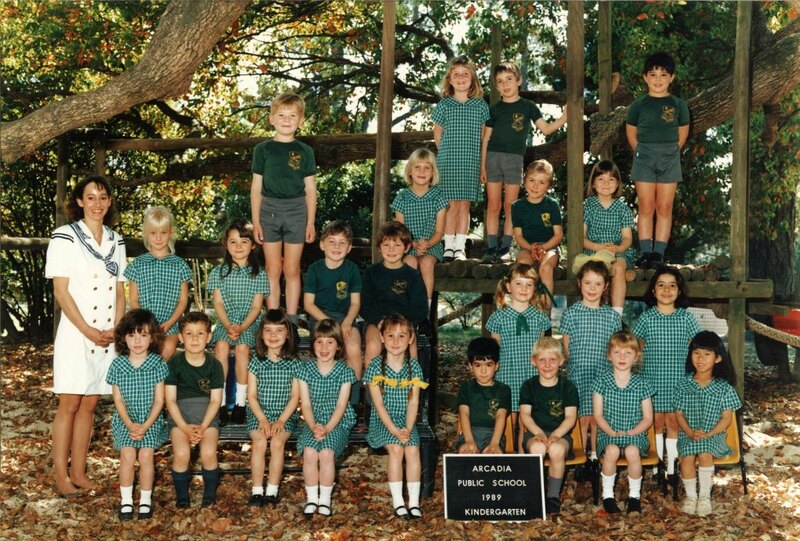 This tradition is continued today. 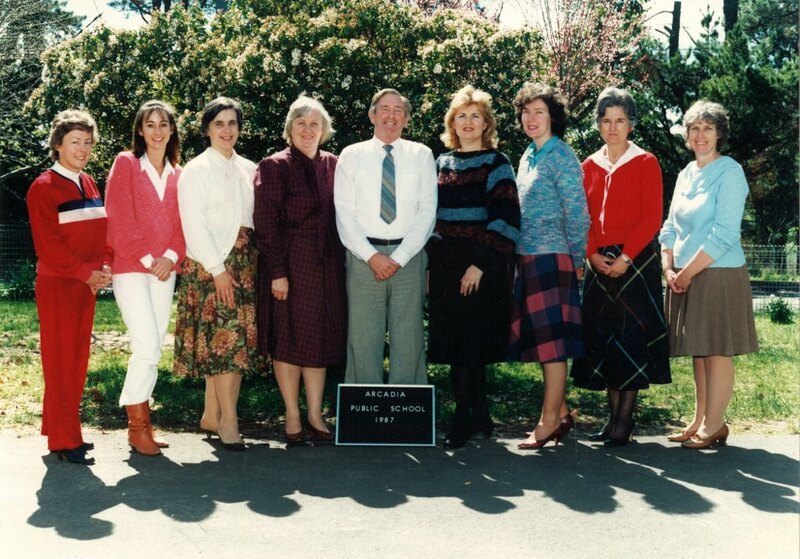 1984 – ‘Safety House’ police program was introduced in NSW. 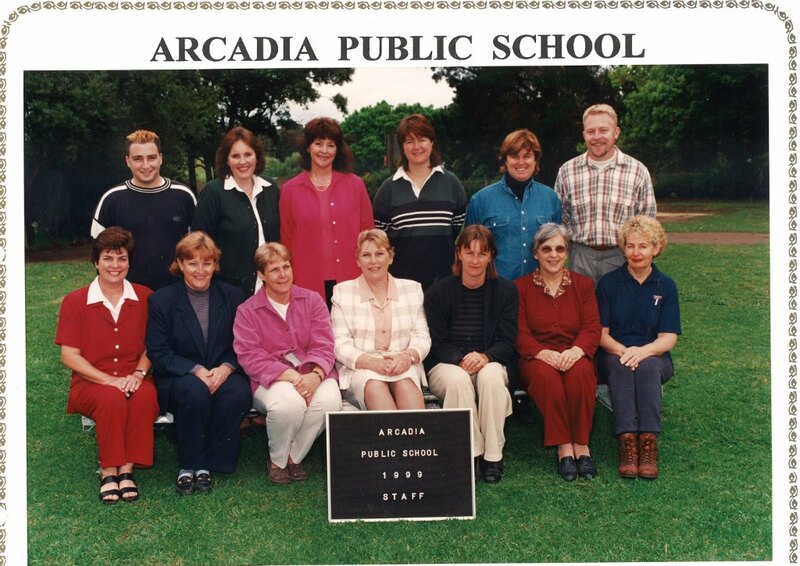 Locally this program was rolled out in April of the same year. 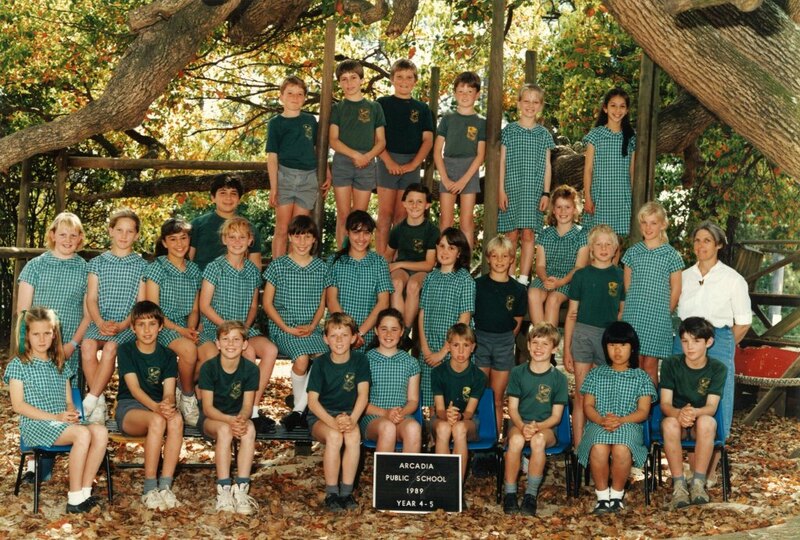 ‘Stranger Danger’ was referred to in the school newsletter in December. 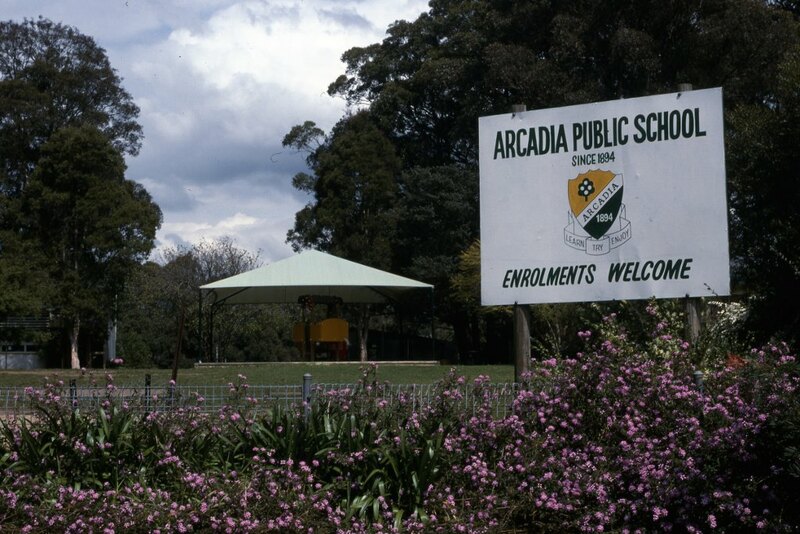 Locals were asked to enrol their homes in the program as a result. 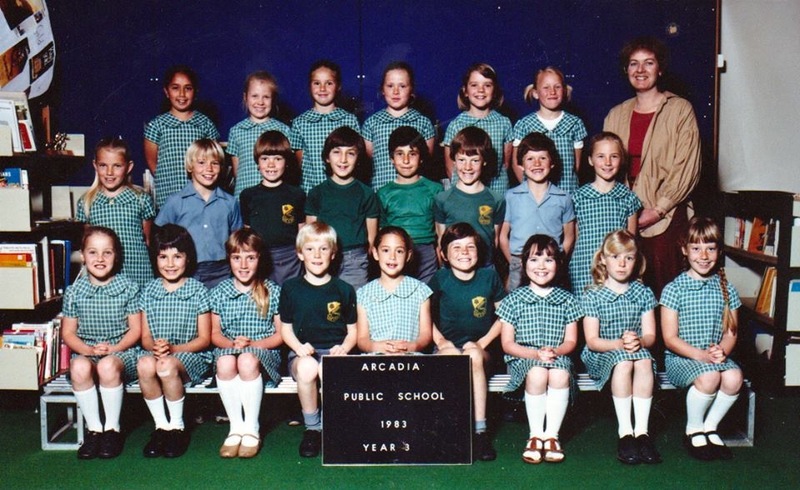 1984 – Galston Supermarket offered a reward program for the school. 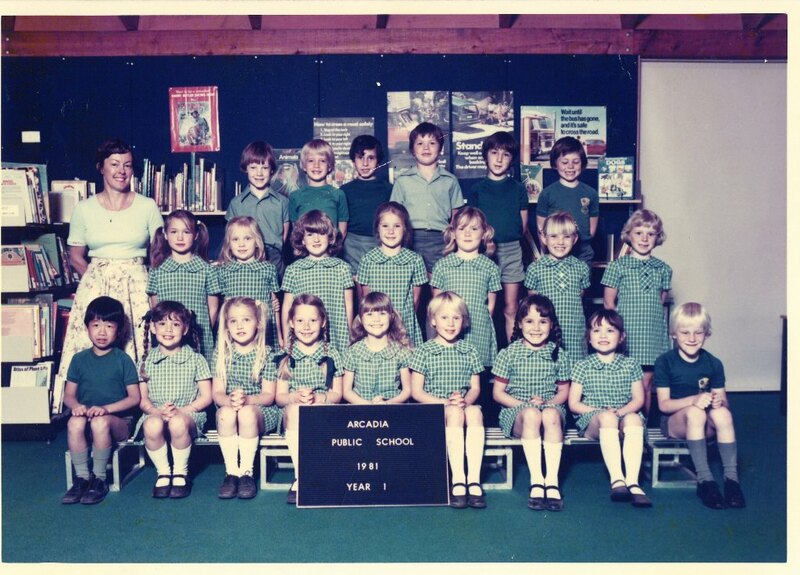 They would donate $500 for every $20,000 spent by parents or teachers at the shop. 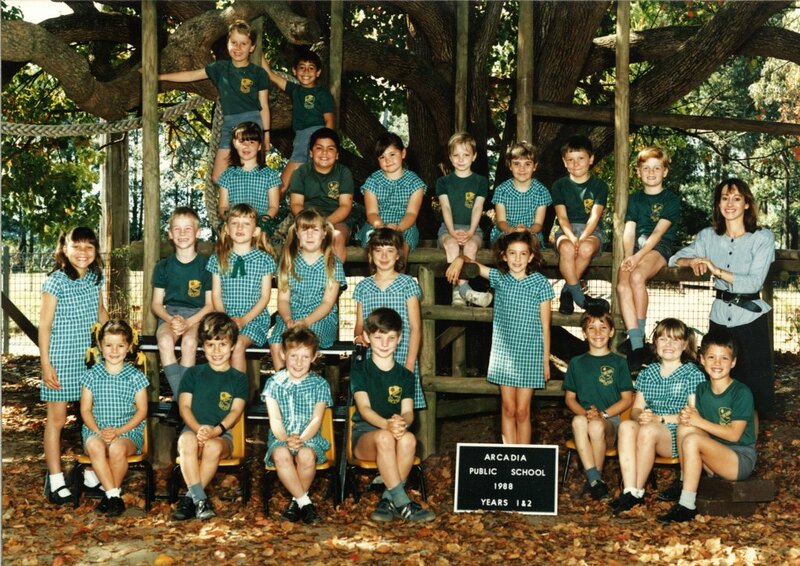 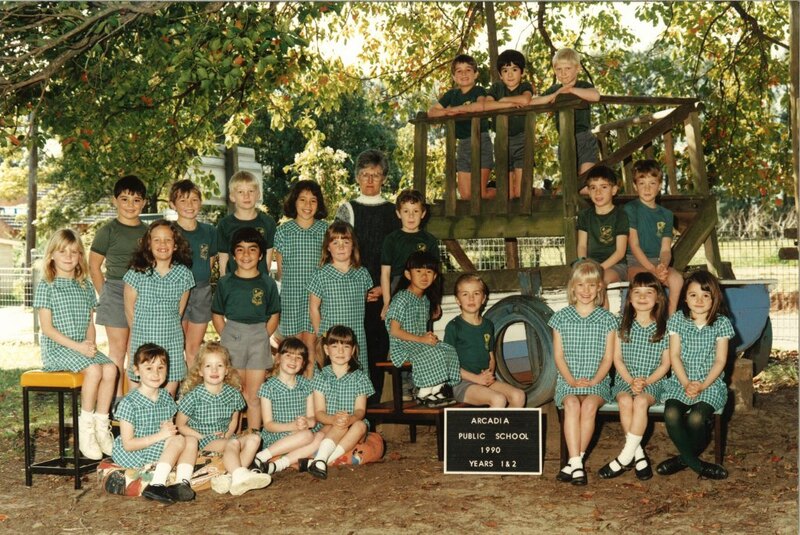 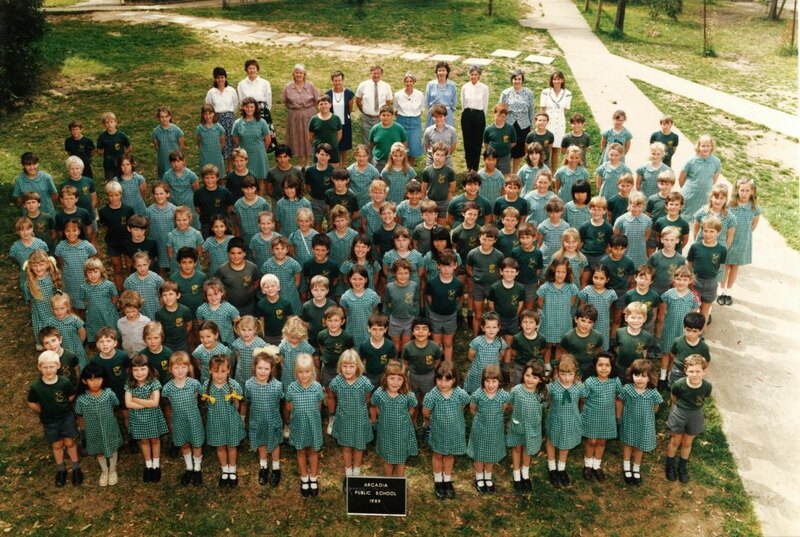 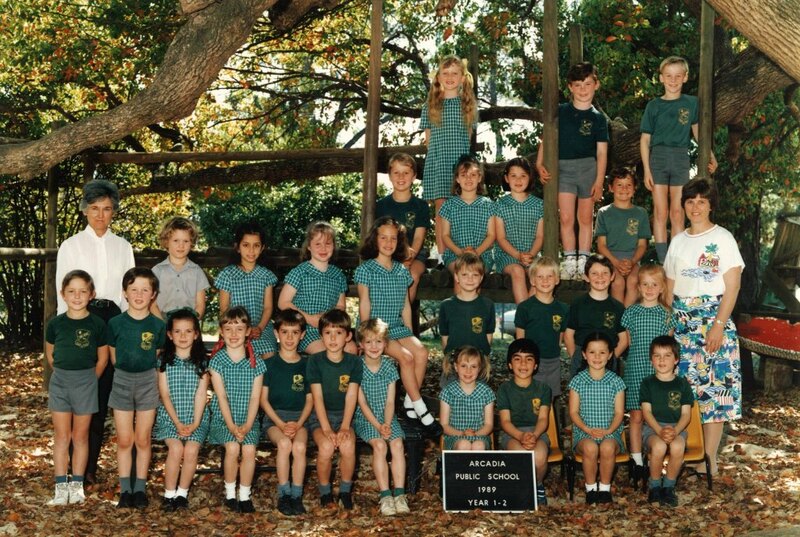 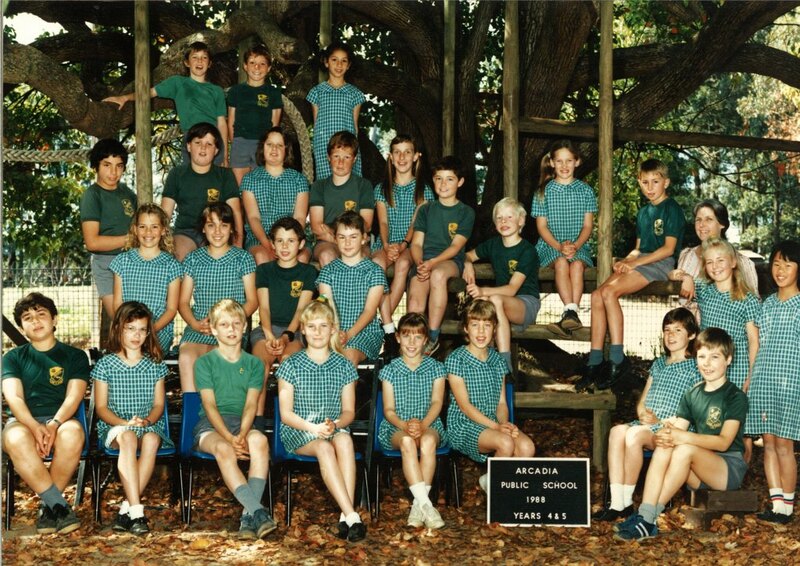 1986 – The 90th year of the school was celebrated with activities and open day held at the school on 1st November. 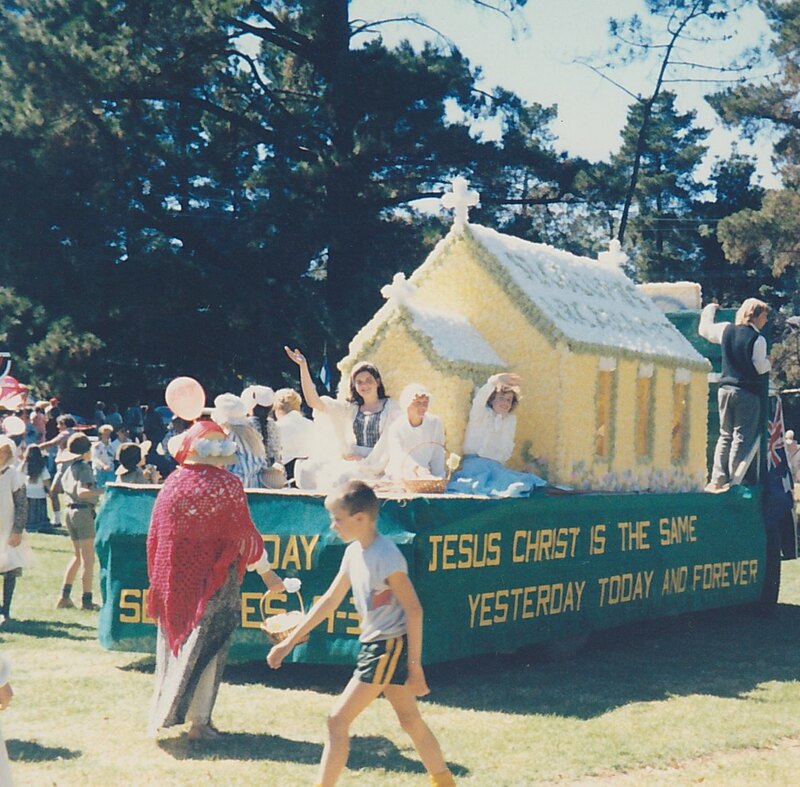 Later research found that the celebrations had been held two years too late. 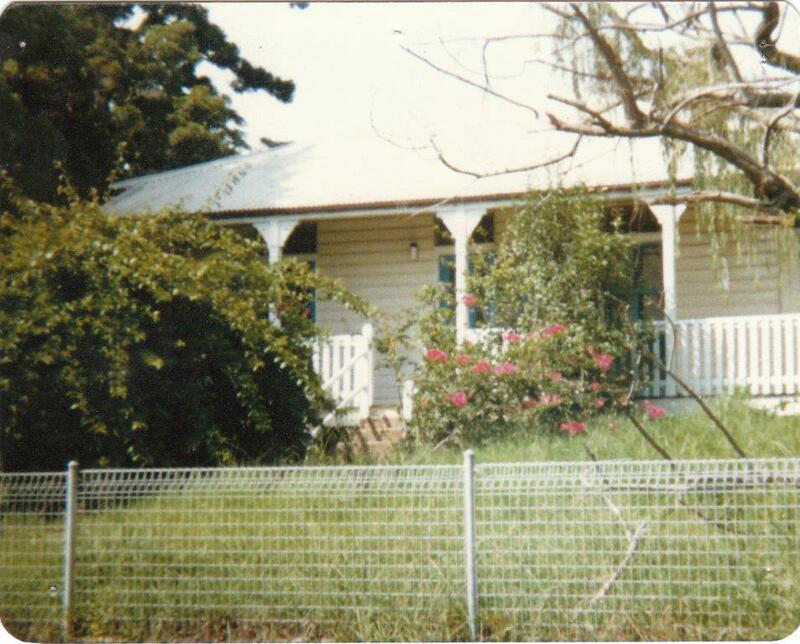 A common mistake for country schools where local halls or homes were used prior to official buildings being erected. 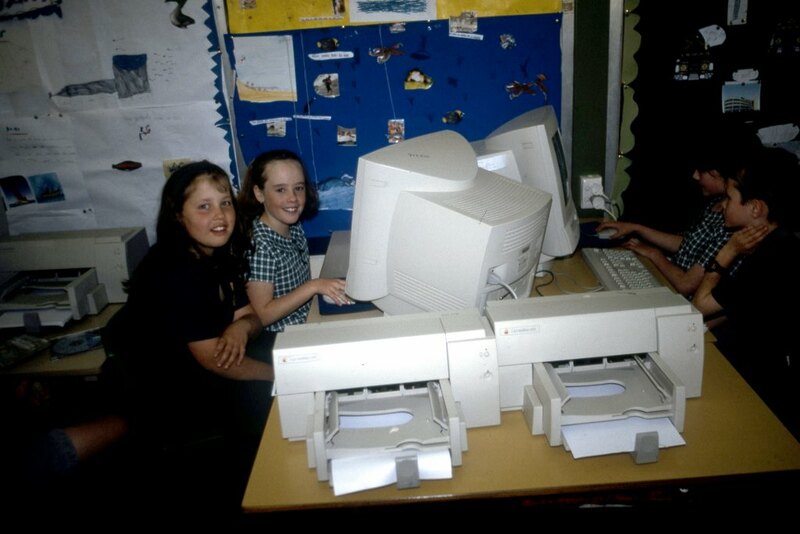 Donations were sort from local businesses for raffle prizes. 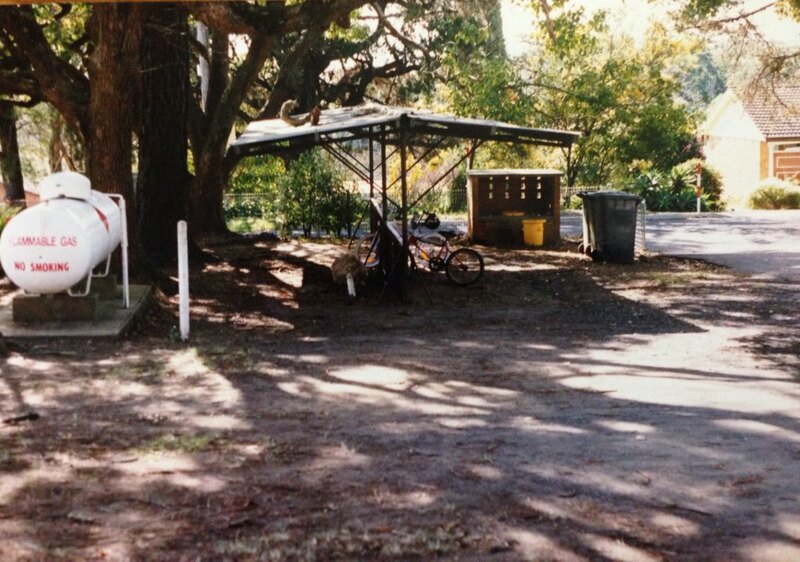 1986 – A new Weather Shed arrived after the first one stood proud for 85 years close to where the toilets are located today. 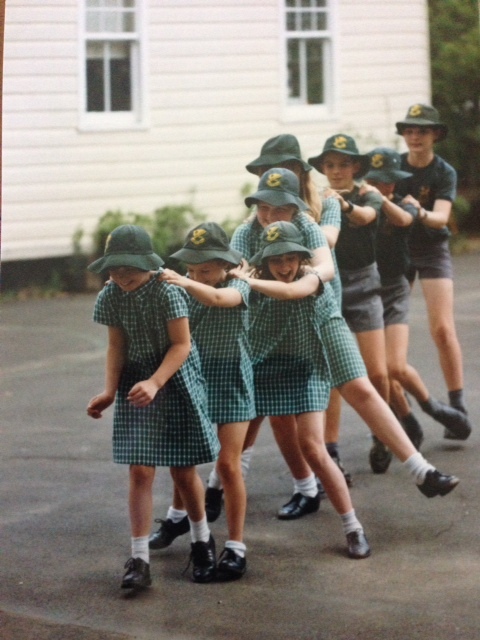 The new weather shed was relocated behind the back row of demountable classrooms which covered the school at this time allowing a bigger playground and netball court to be constructed. 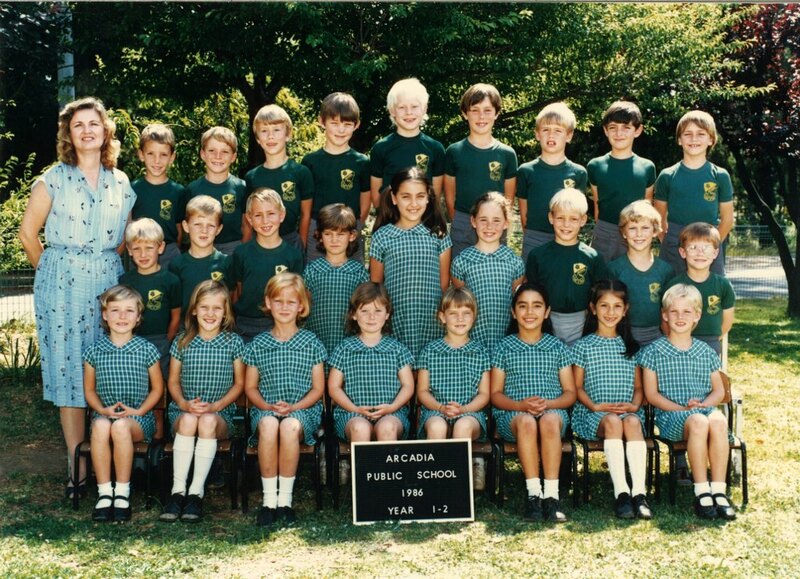 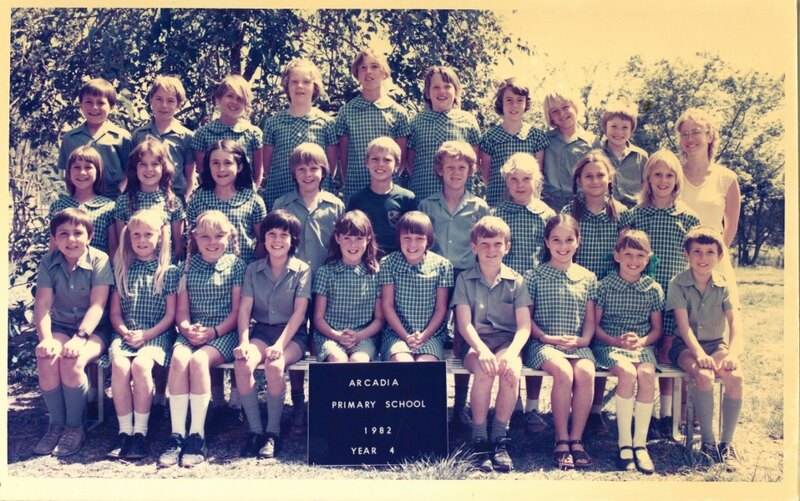 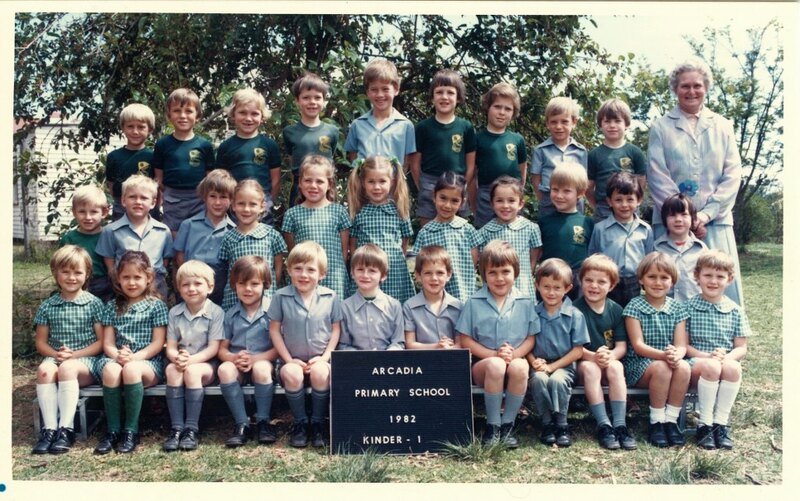 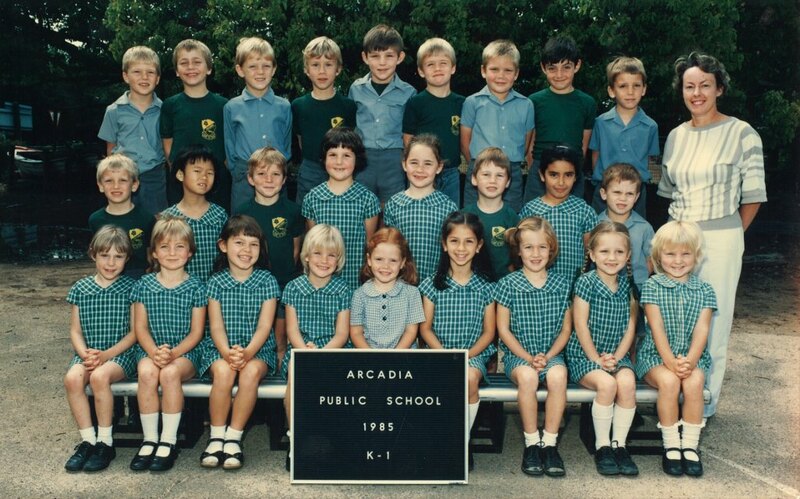 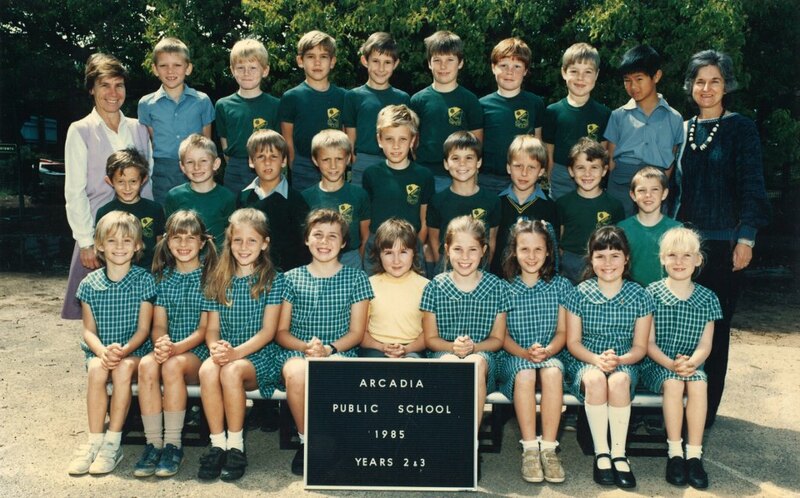 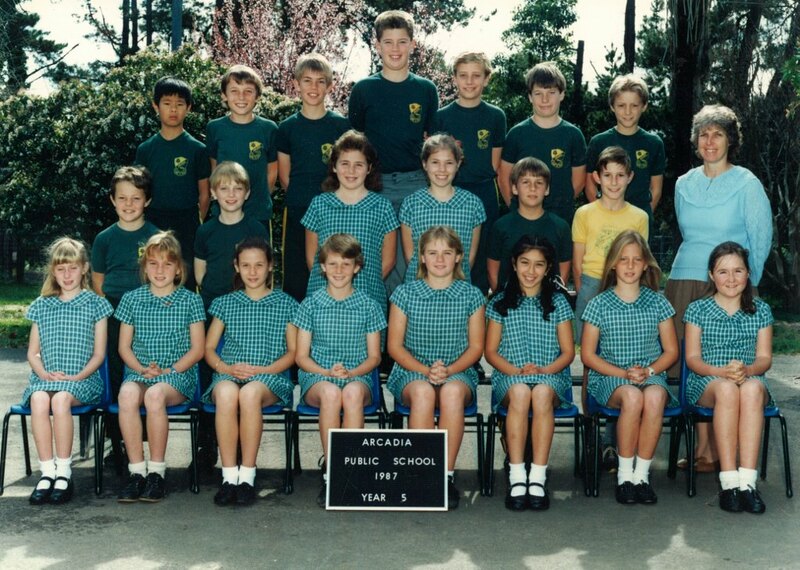 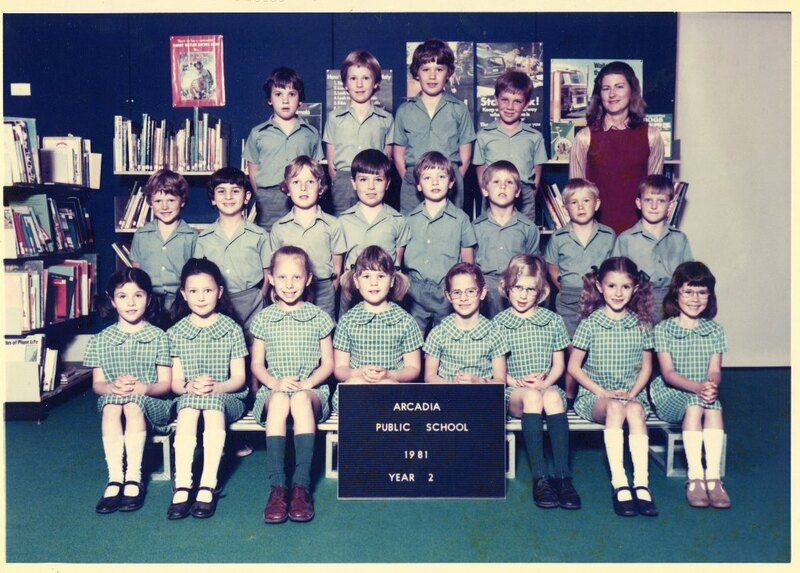 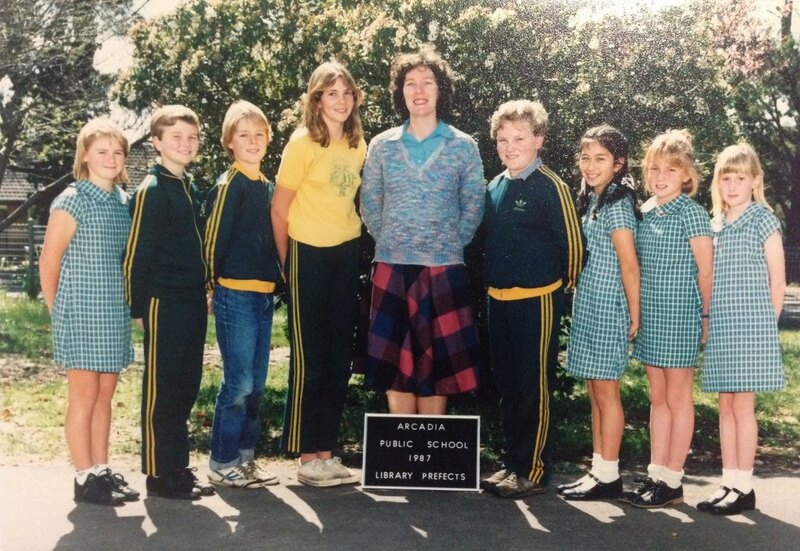 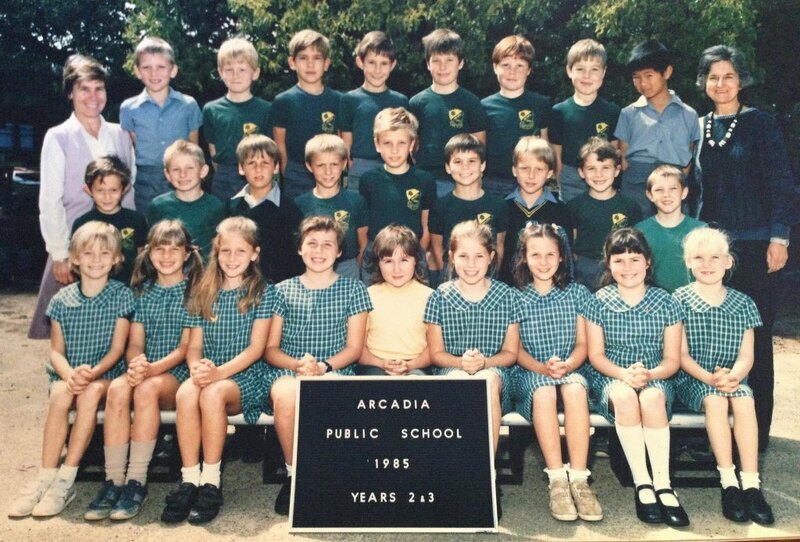 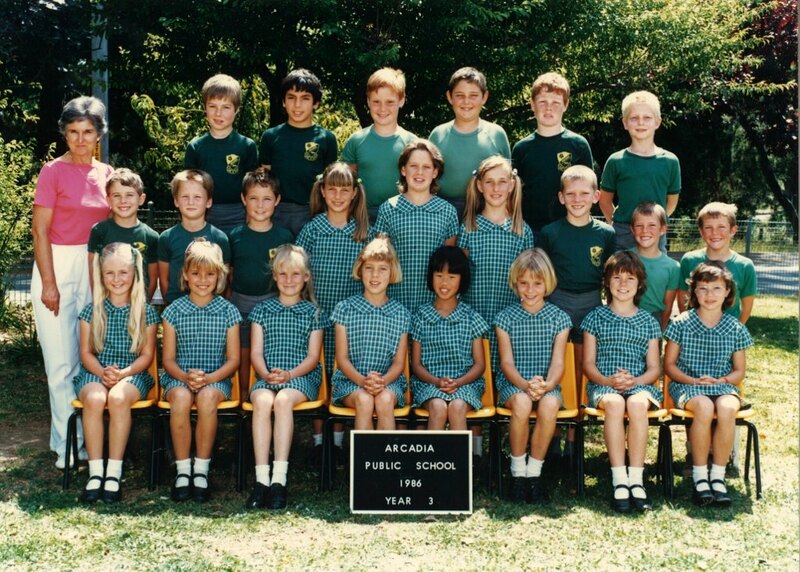 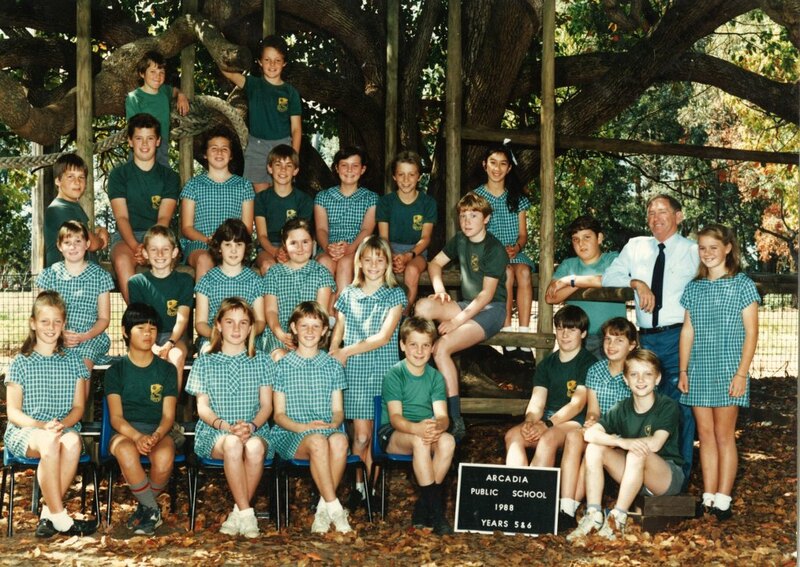 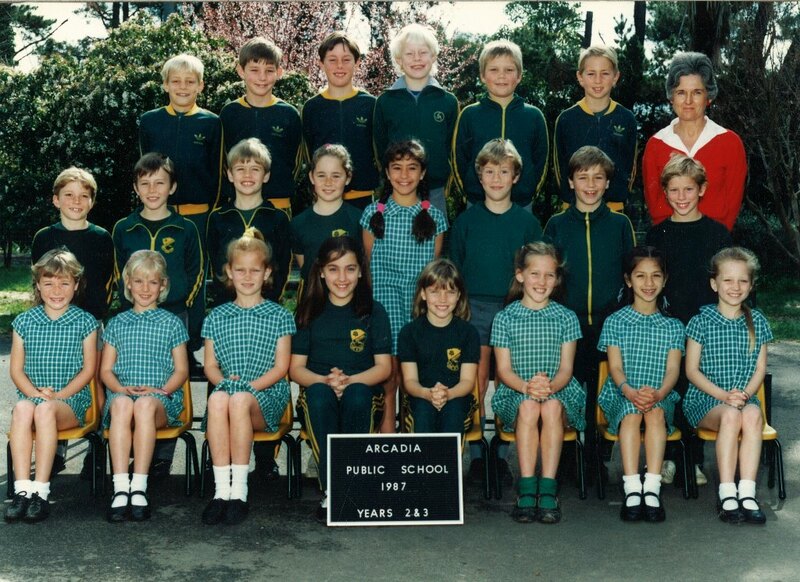 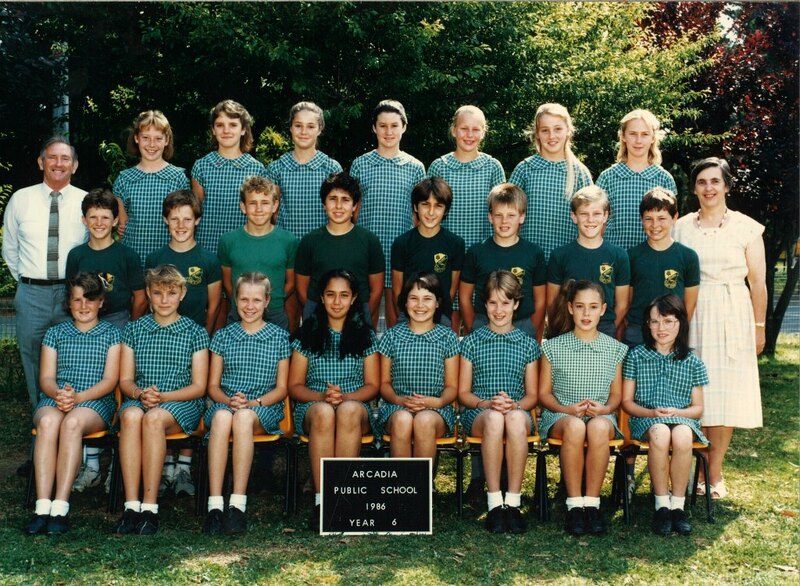 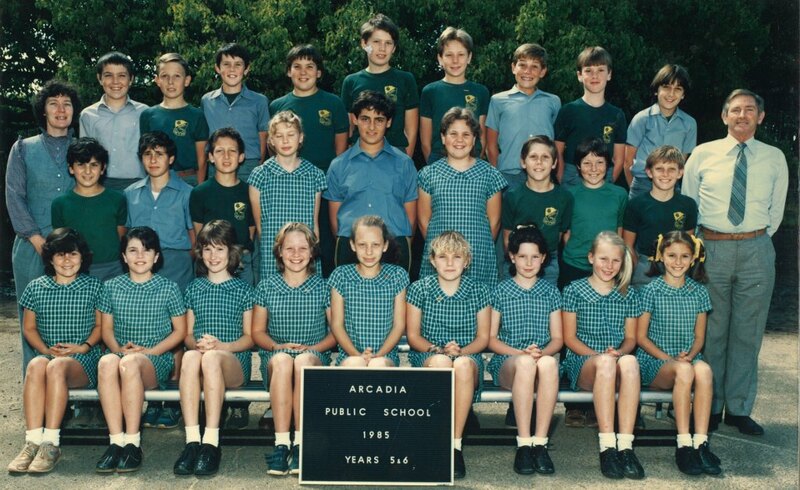 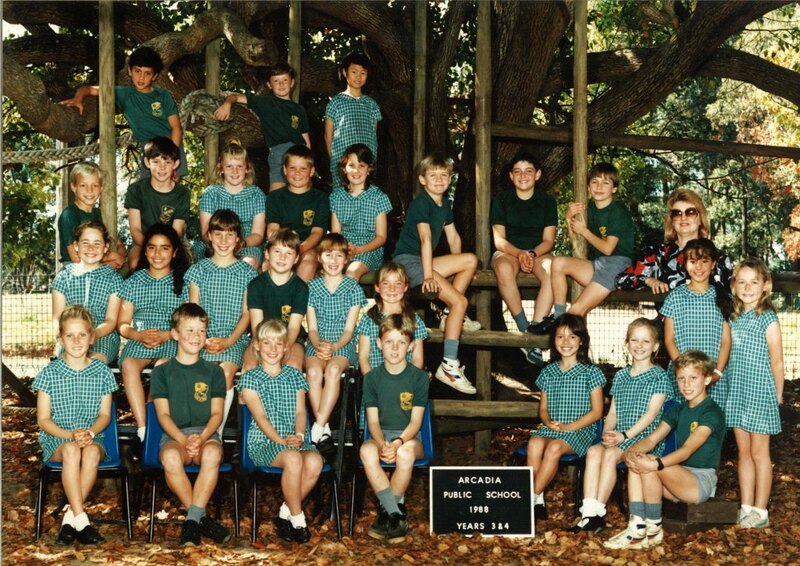 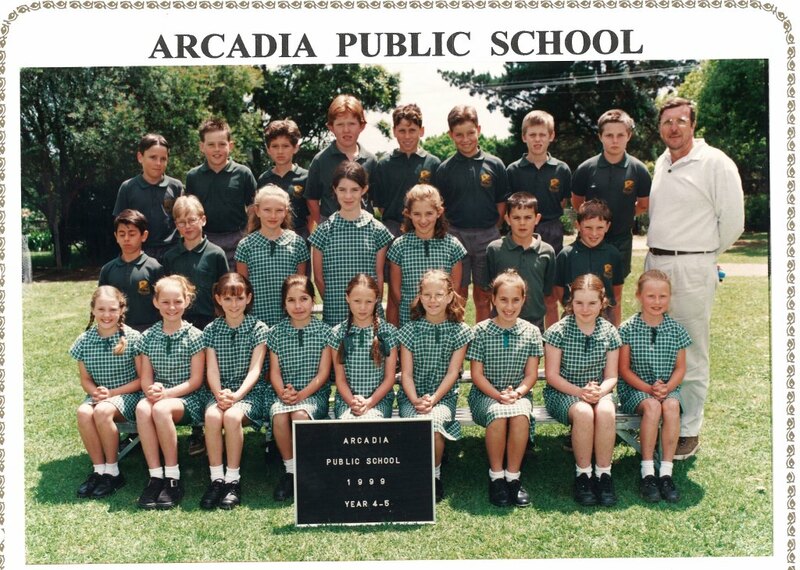 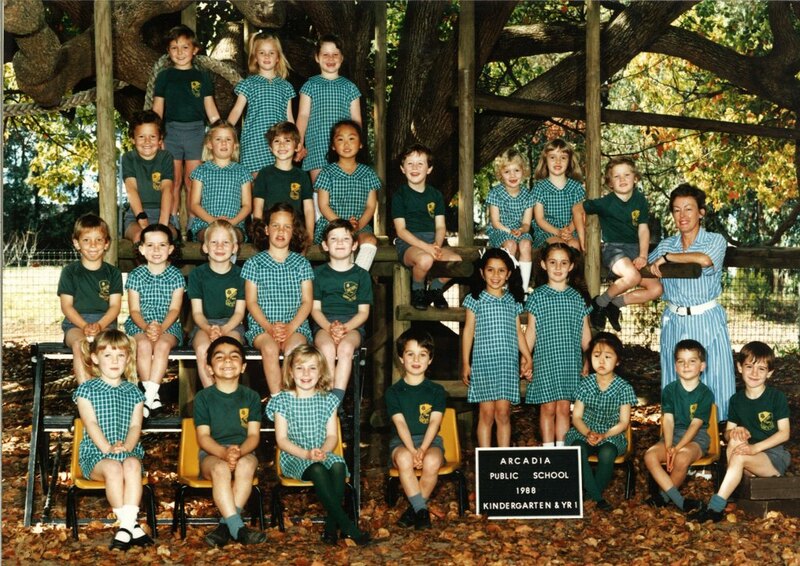 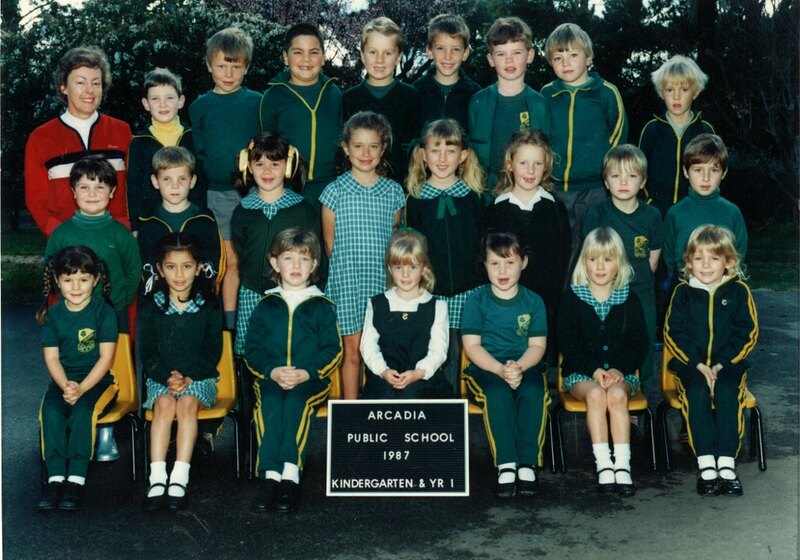 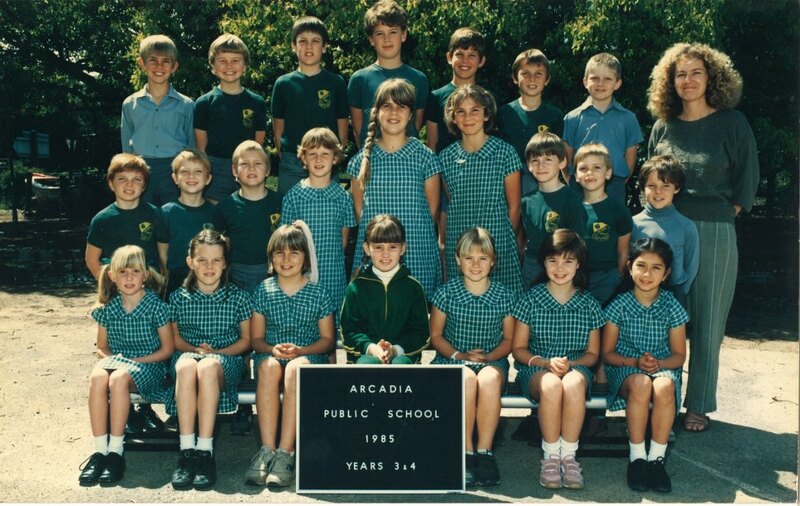 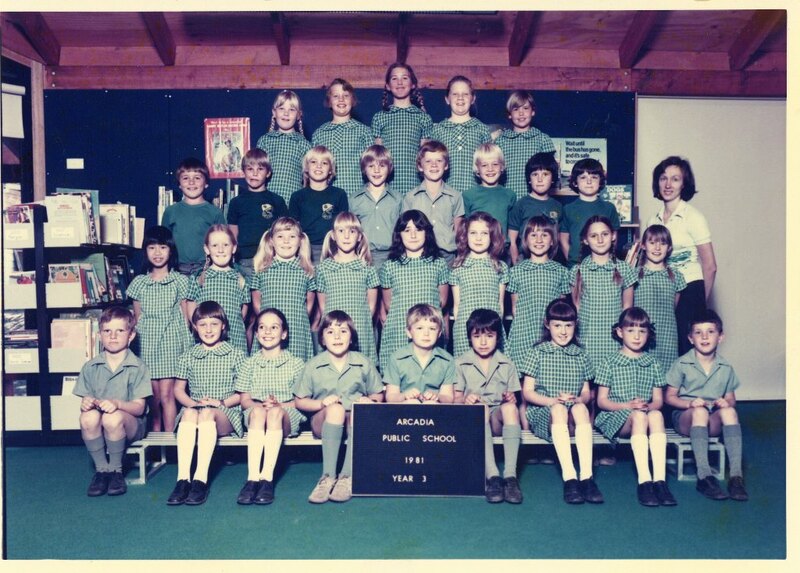 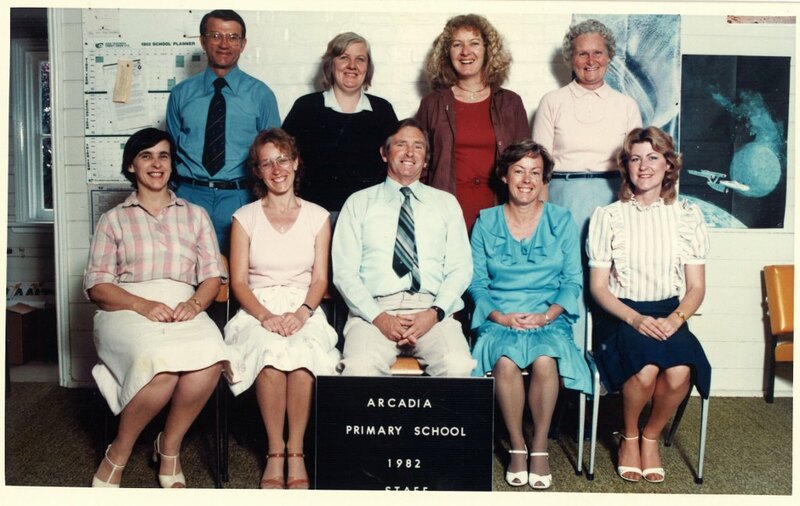 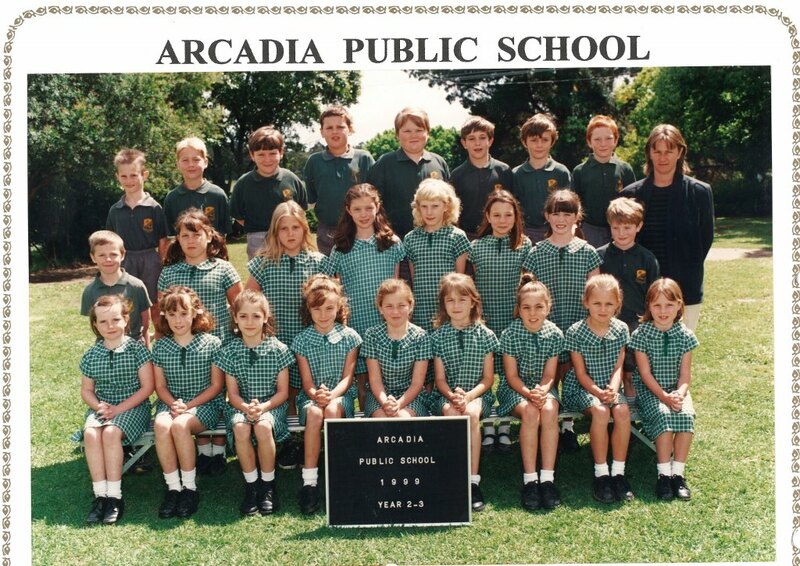 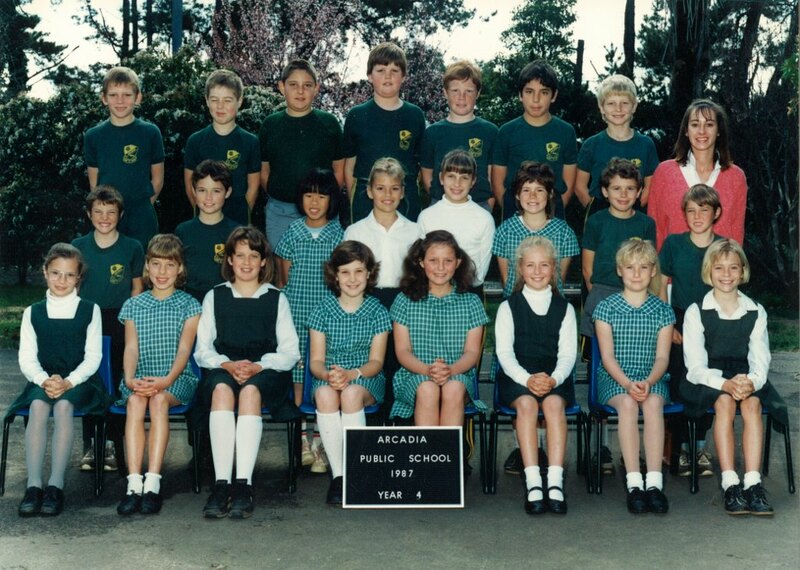 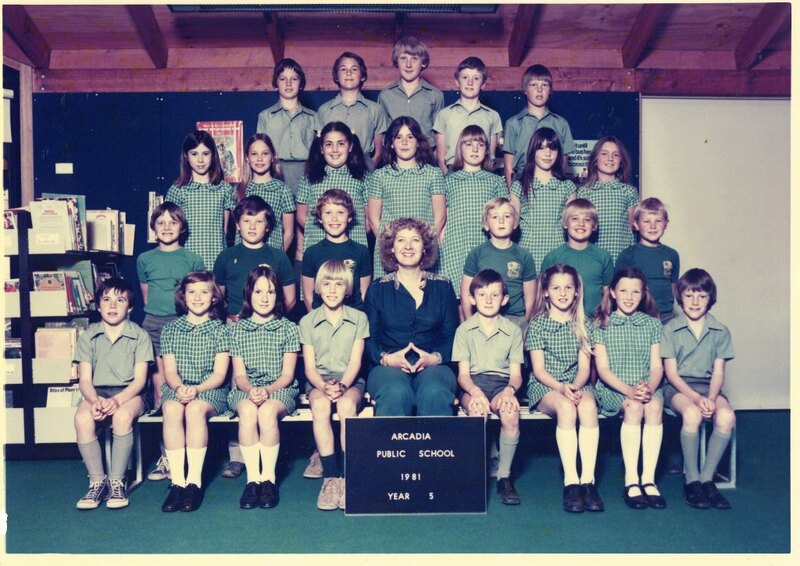 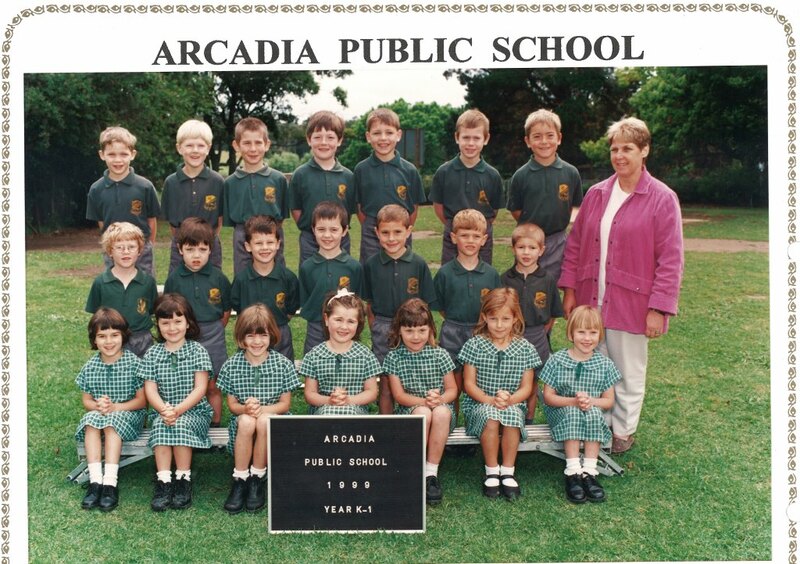 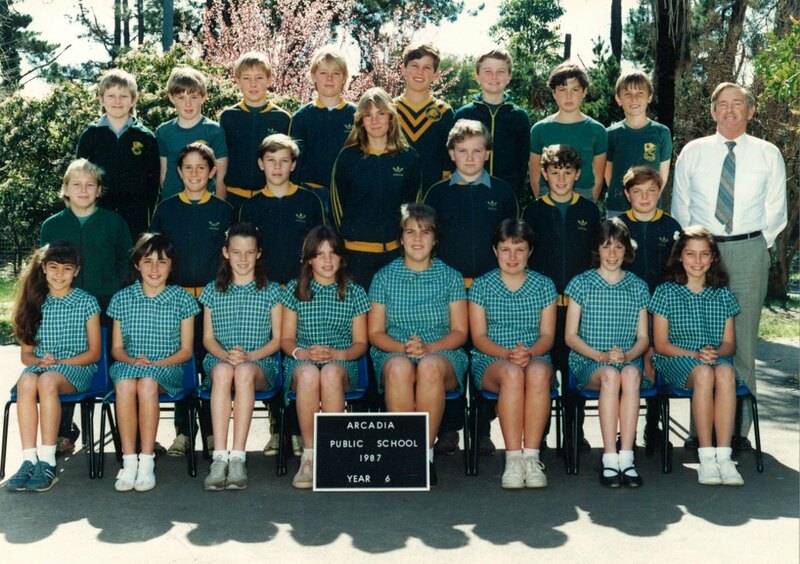 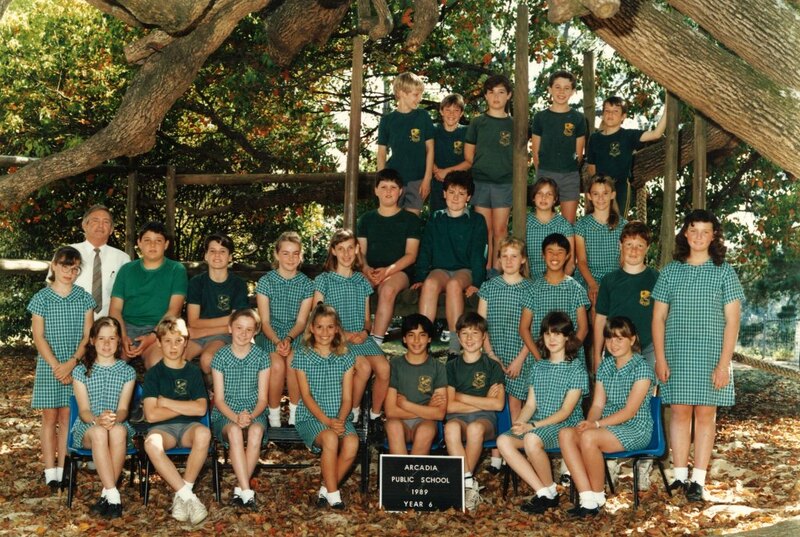 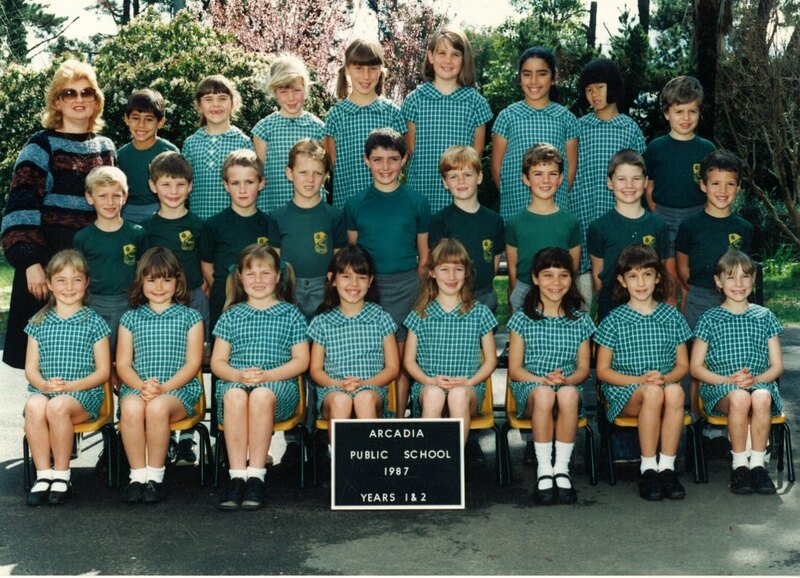 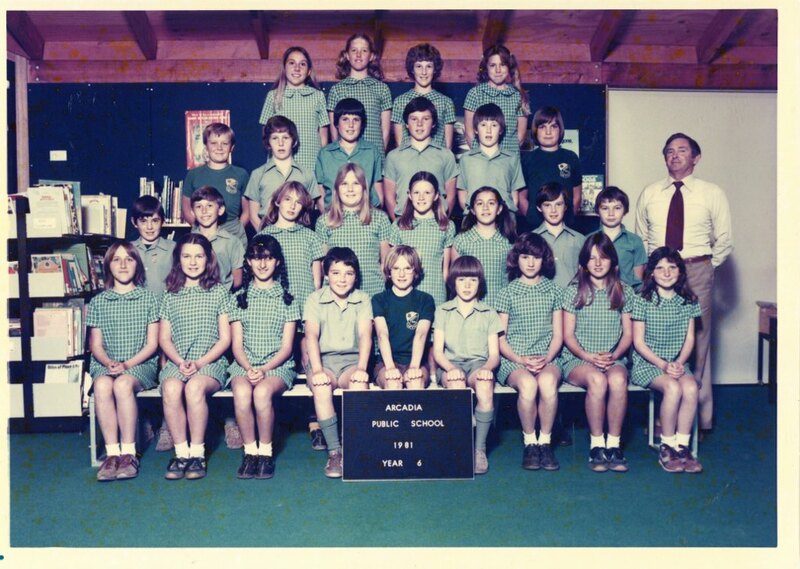 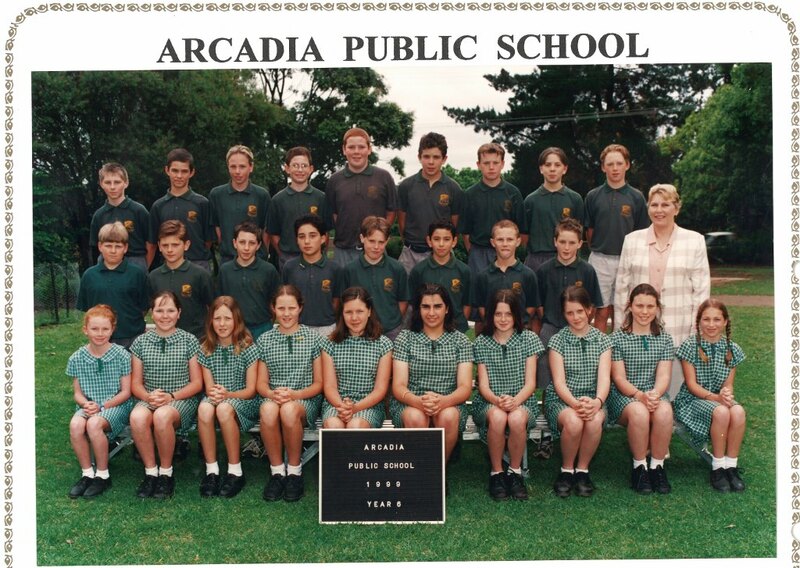 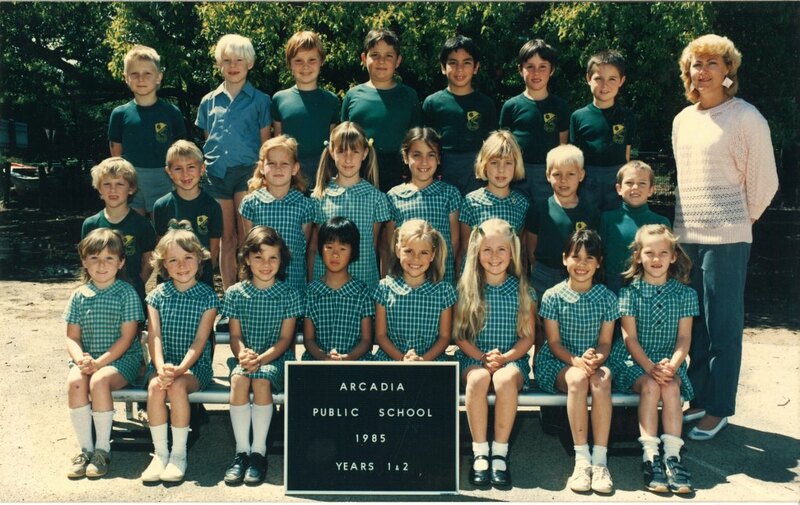 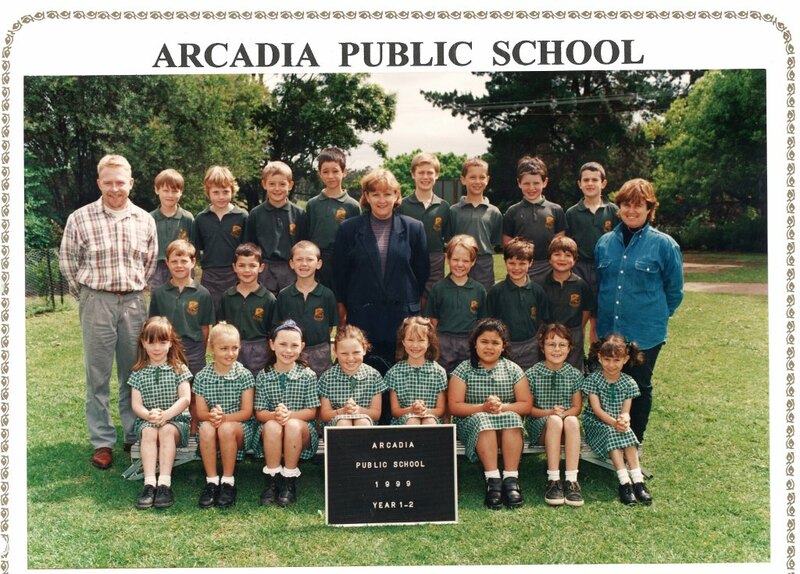 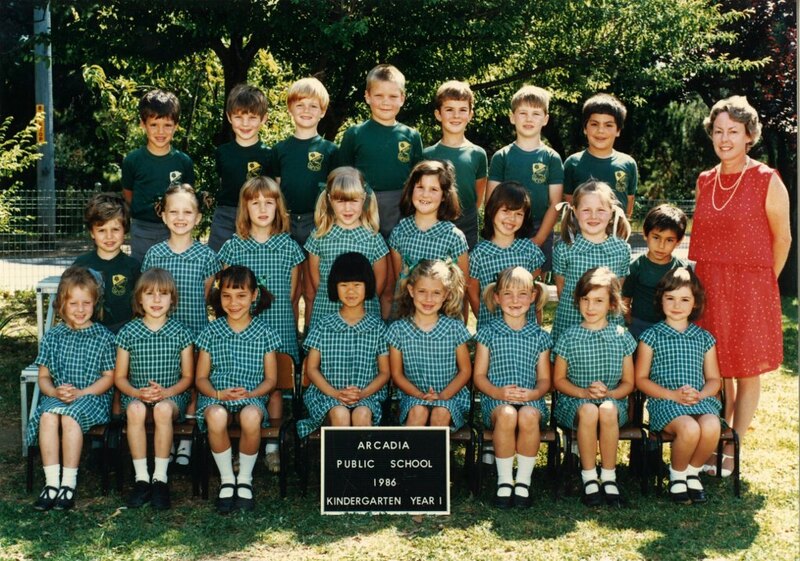 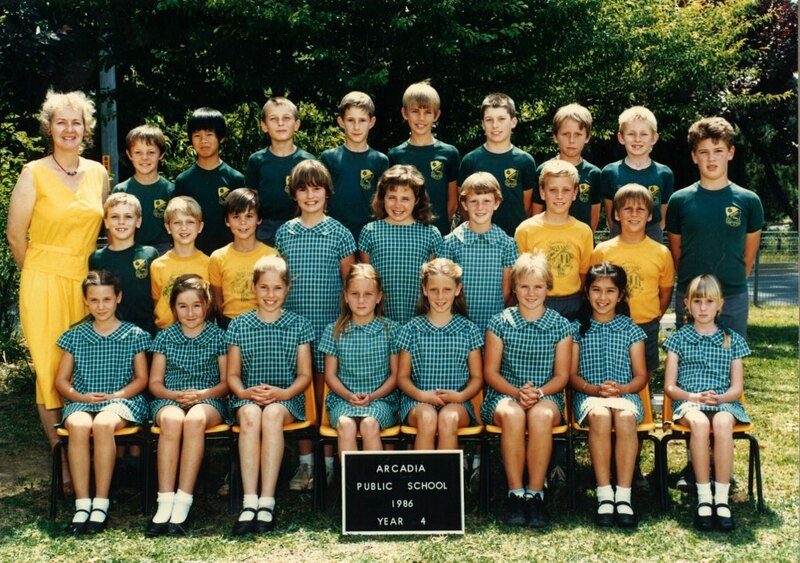 1986 – Mr Ian Thomas, a teacher at Arcadia wrote the school song. 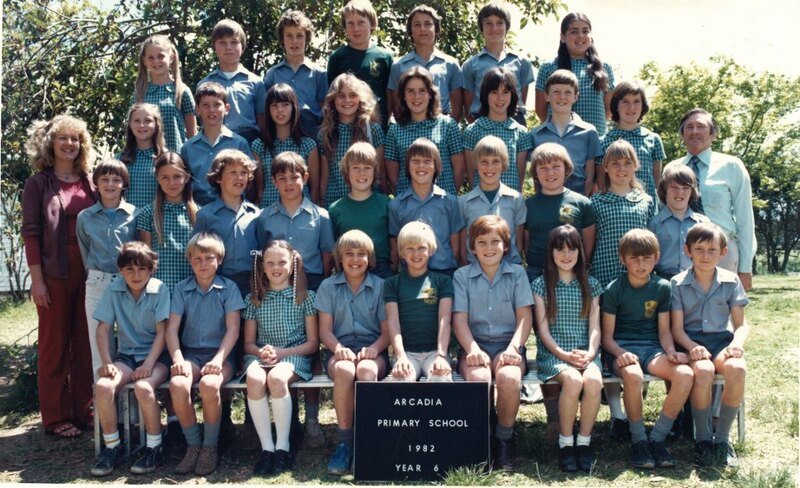 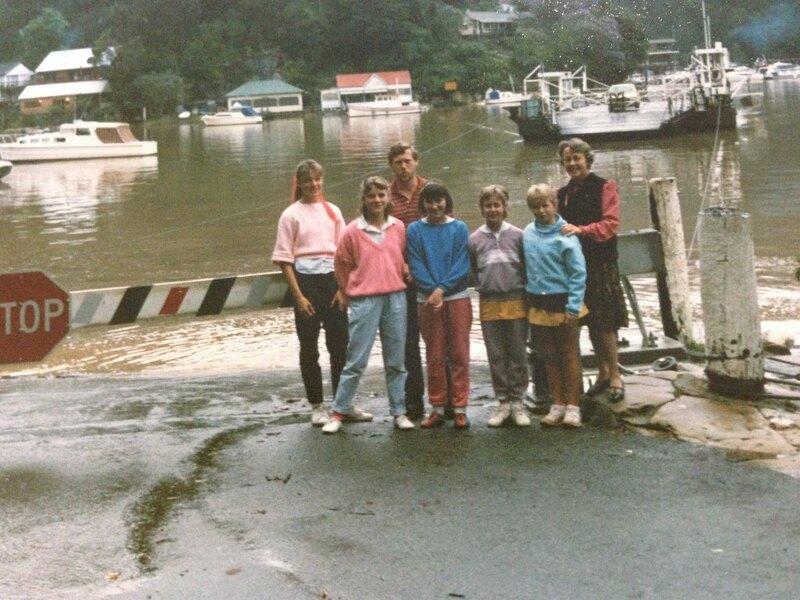 1986 – Berrilee Public School held a fireworks night on the 31st May. 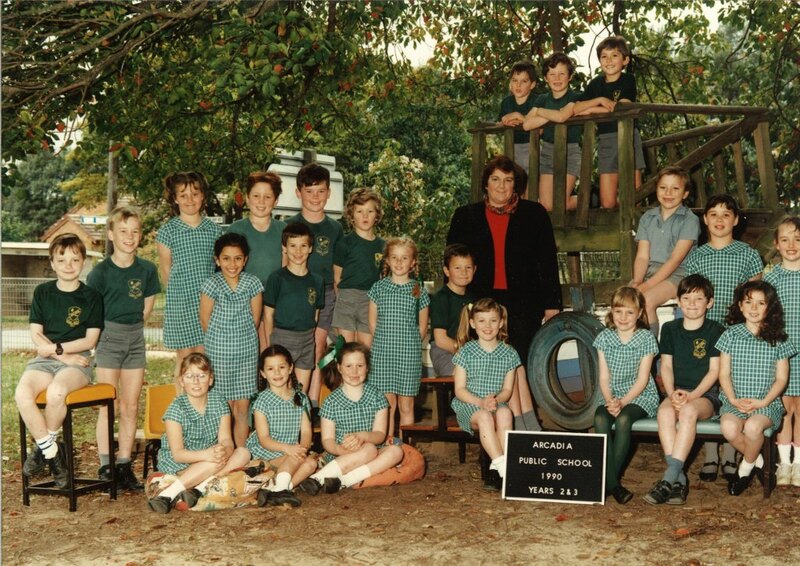 1987 – The four term year was introduced. 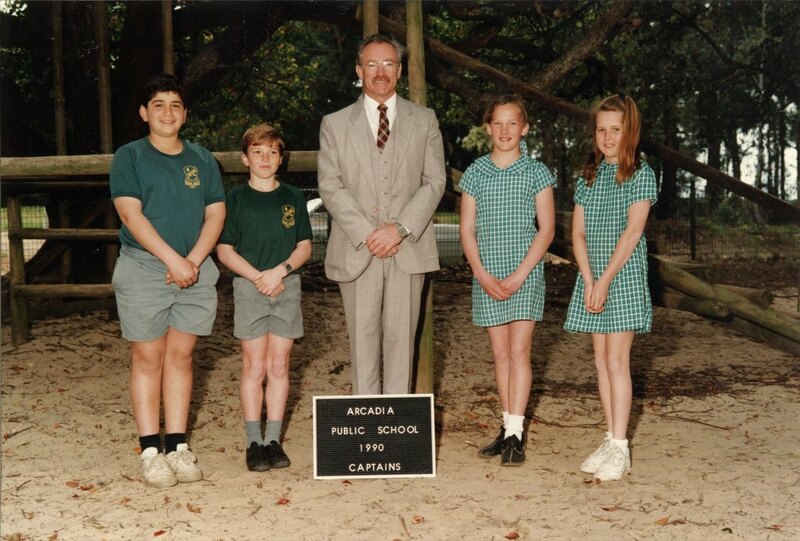 1988 – Fagan Park opens to the public. 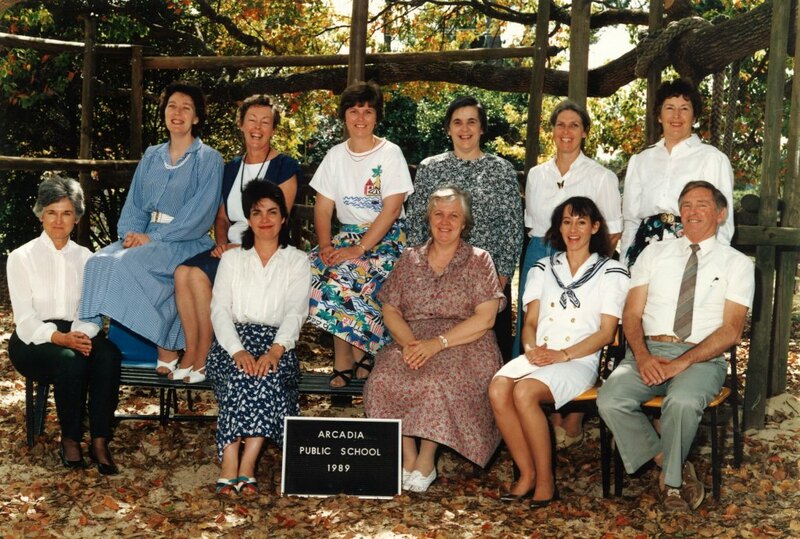 1988 – A small demountable arrived in January 1988 to house a Principals office, storeroom and lobby. 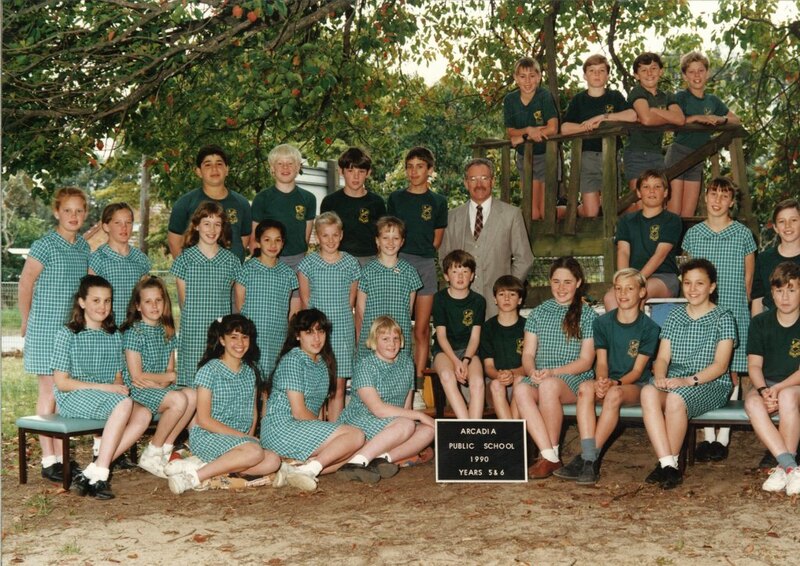 1990 – Mr Stan Shore was Principal from January 1990 till 1997, 137 pupils. 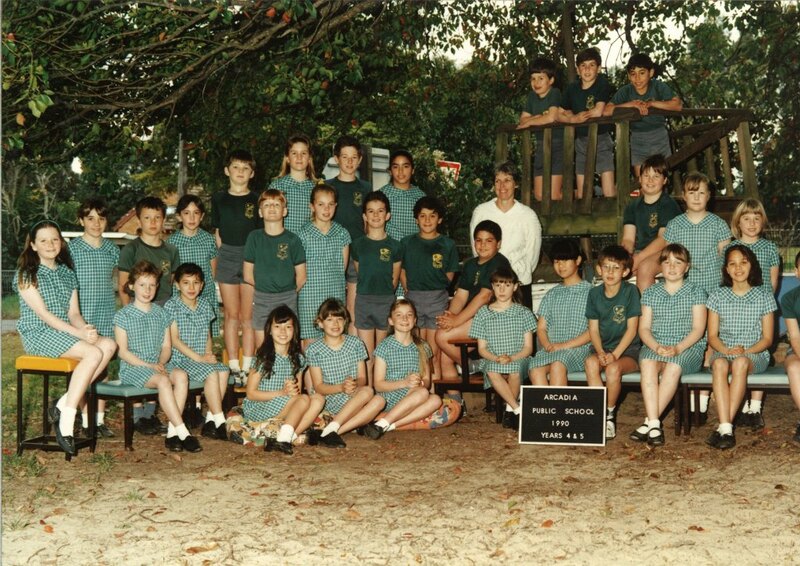 1990 – The introduction of Global Budgeting for schools.